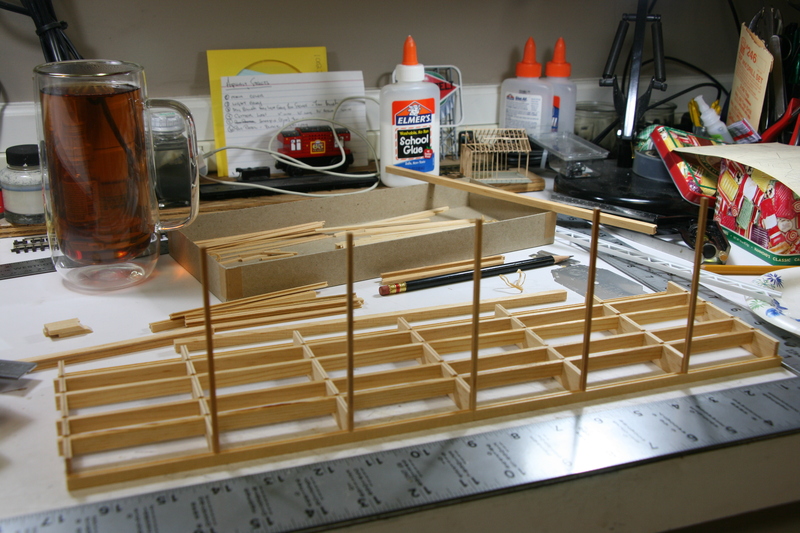 On the workbench is one of the “special projects” I had mentioned last time. The backstory on this is that the upper level represents northern Minnesota. And in the Land of 10,000 Lakes we seem to have an equal number of rivers running someplace. This is especially true up north where everything is draining towards Lake Superior. A spot just ahead of the junction looked like it was just crying for a nice double track truss bridge over a river. So I hauled out the Walther’s catalog (www.walthers.com) and started looking for one. 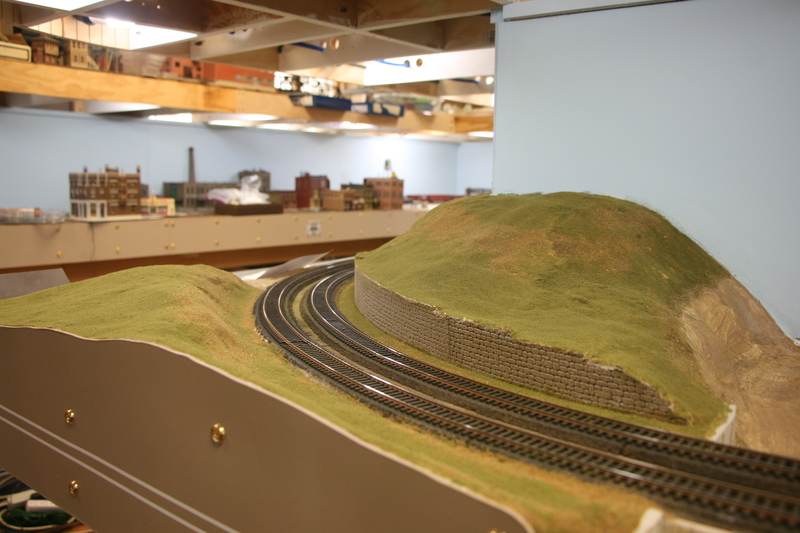 When I got to the Campbell Models section (campbellscalemodels.com) I realized that I had one tucked away somewhere. Started digging and finally found it. And thus the project started. Where I want the bridge to go. As you can see by the price I’ve had this awhile. The sticker on the box says $24.75, the current suggested retail is $70.00. Opened it up and everything was there, well, almost everything. Much like the missing decals for the Whale Belly tanker, the instructions for the bridge went missing. So I headed on over to Campbell’s website to see if I could get a set of instructions. It turns out that you can, once you prove you own the kit. I’ll be honest, I was a bit taken back by this. 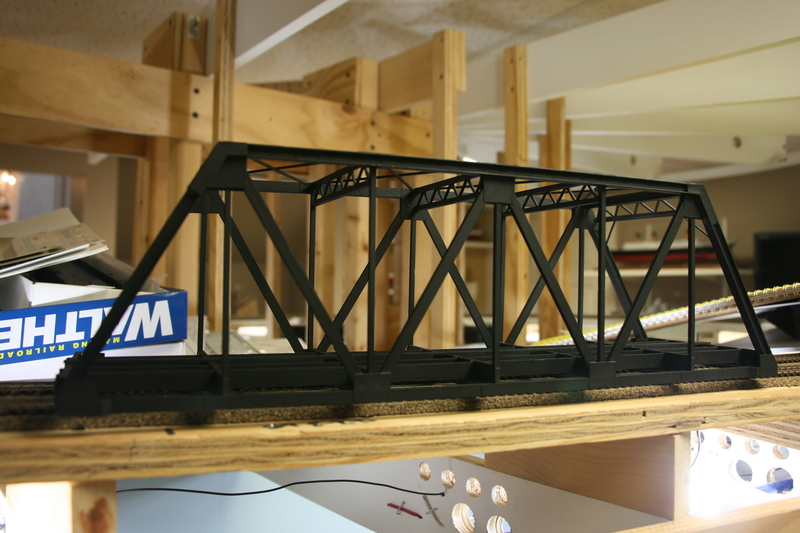 I got over it once I realized that the instructions were mainly full sized templates that you built the bridge over. 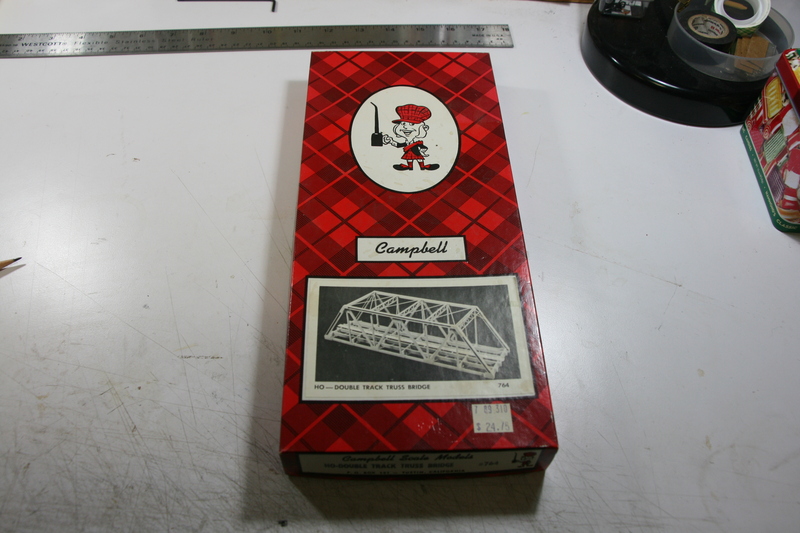 Having those in hand you don’t need Campbell’s kit, as you could supply your own material to build the bridge with. Not wanting to wait for the instructions I headed to Google images. 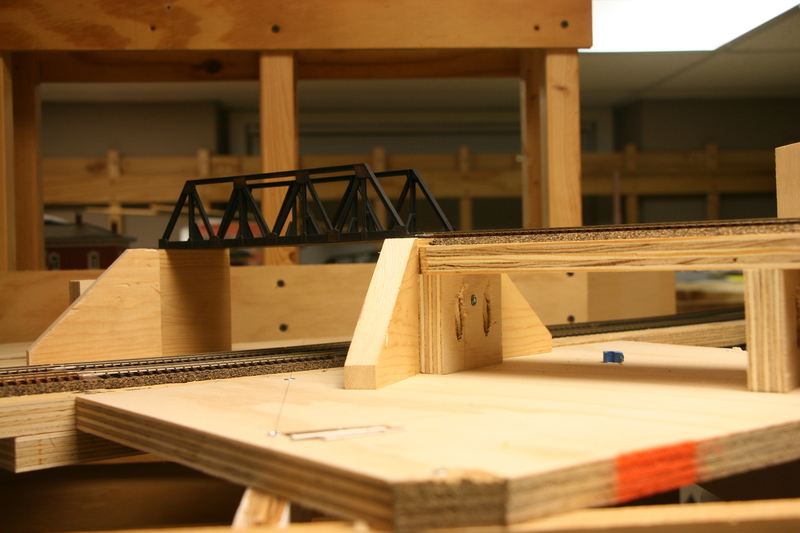 I found plenty of images of the finished bridge, all the same shot. But I did find an image that was a shot of part of the instruction sheet. It was nice as it showed about half the bridge with cross sections of the various pieces. So I printed it out and figured I would wing the rest. 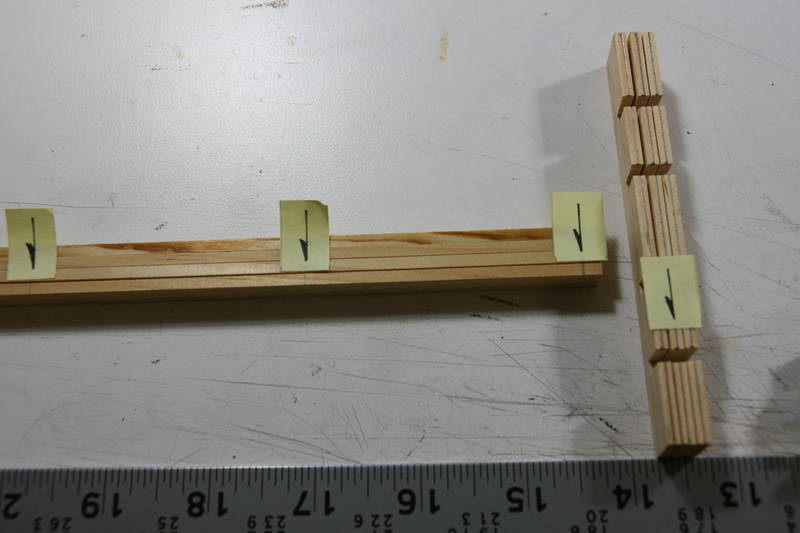 The first thing was to figure out the spacing on the cross beam/supports. 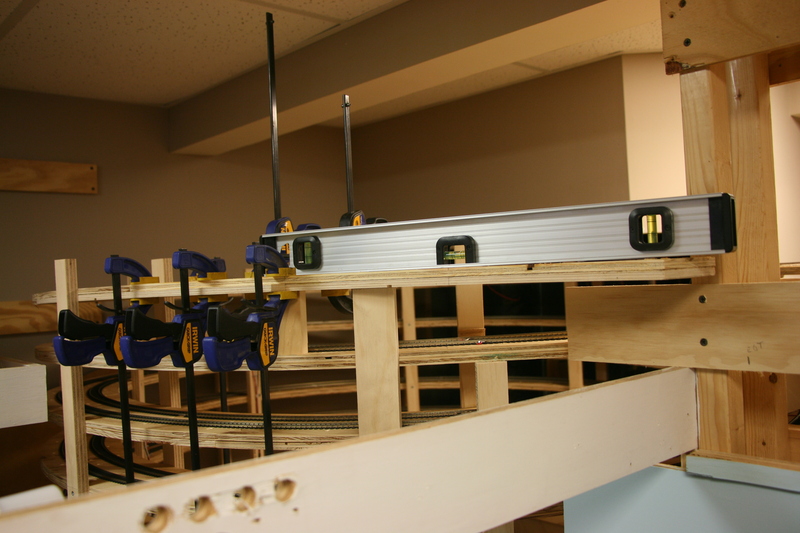 I took the total length and dived for the seven cross beams. I also marked the centerlines of the cross beams. The alignment marks in place. Then using my square I started gluing up the base. Everything aligned and squared off. Having squared up and glued the base sections I made myself wait till everything was set and dried. Not an easy thing when you could charge ahead, even though not everything was set. Once the glue was dry I moved on. 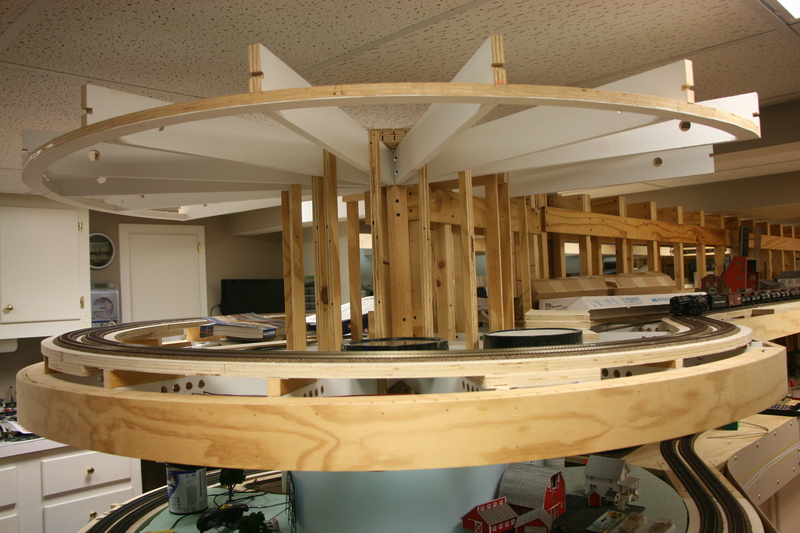 Next up was the base longitudinal stringer and the vertical uprights. Setting the uprights in place. 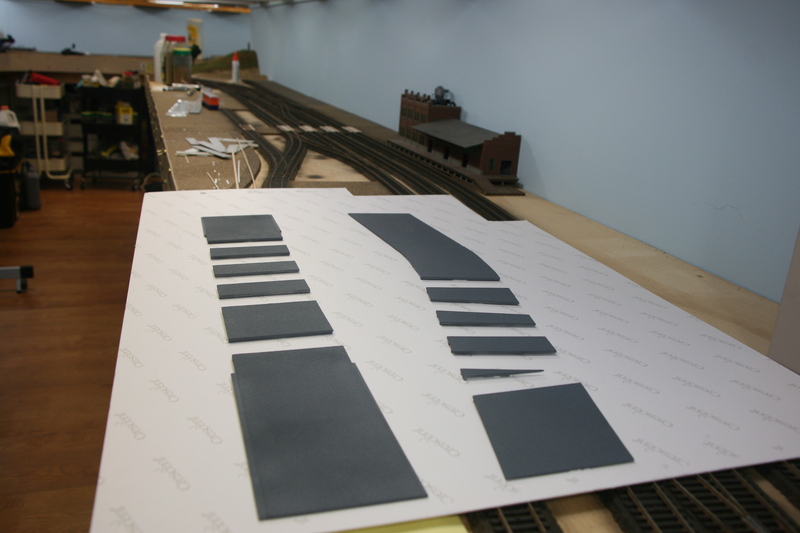 Lastly, the end diagonals and the top stringers along with the embossed paper gusset plates. First side done, with gussets in place. I realized that if I had the instructions I would have built the side panels over the templates and then glued them to the base. 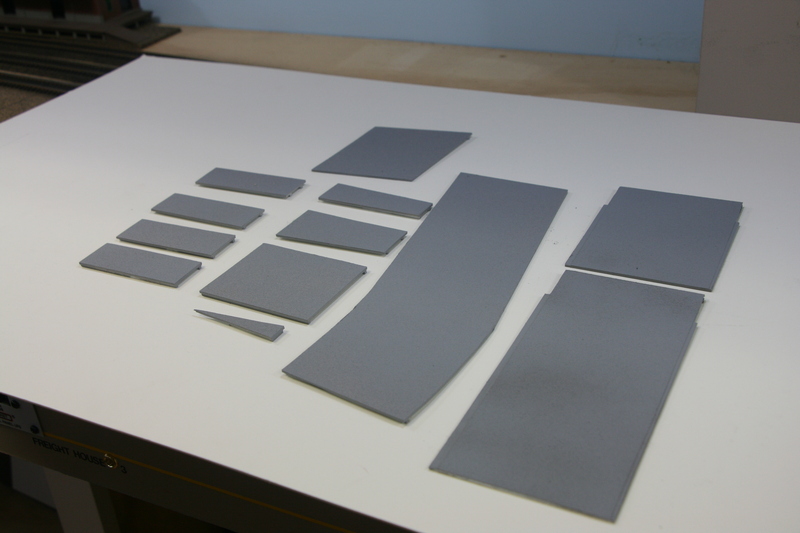 I figured this out mainly from the gusset plates as I had to cut them to fit around the finished pieces. 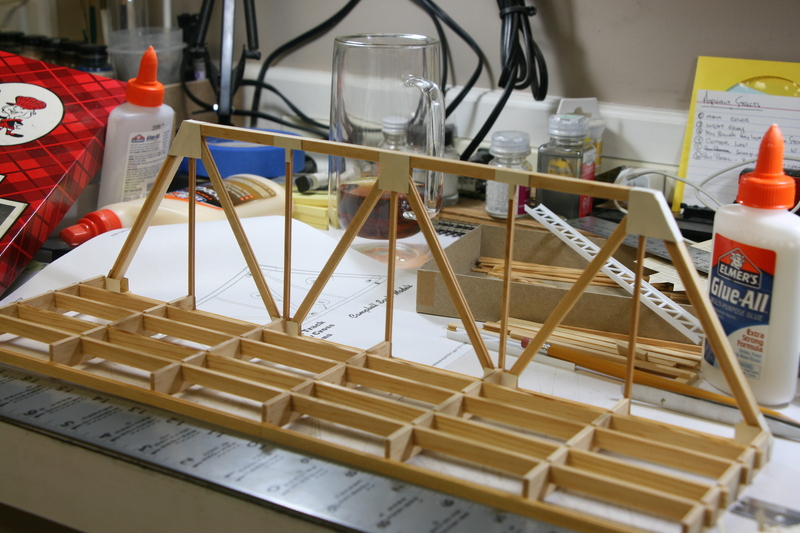 The next photo is of the finished bridge primed. 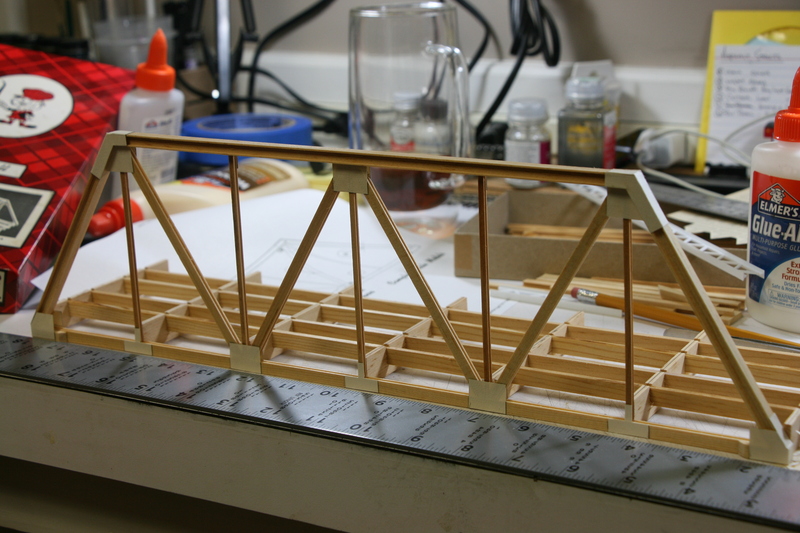 The bridge done and primed. I have to apologize, I didn’t take pictures of the other side being done, just seemed redundant. And then I was suddenly finished with it. The main thing I missed by not keeping the photo record going were the upper web trusses. 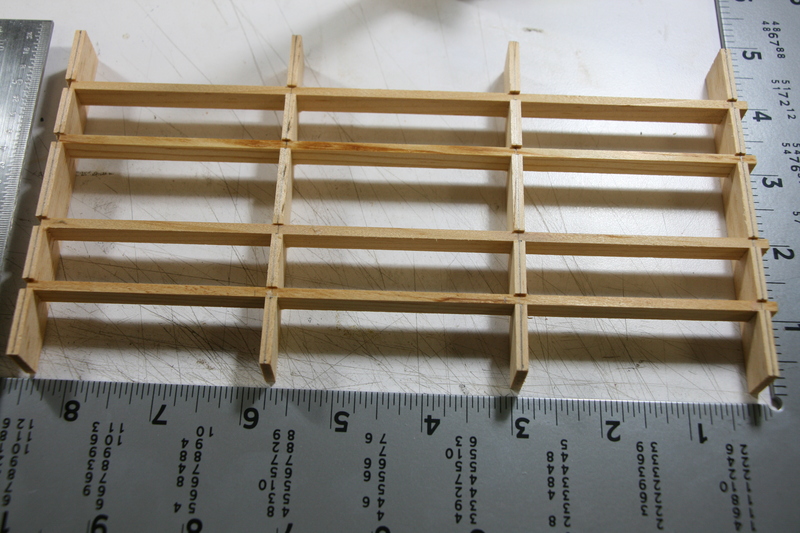 Campbell had you making these up with small pieces glued into a balsa channel. For this I would have needed the templates. 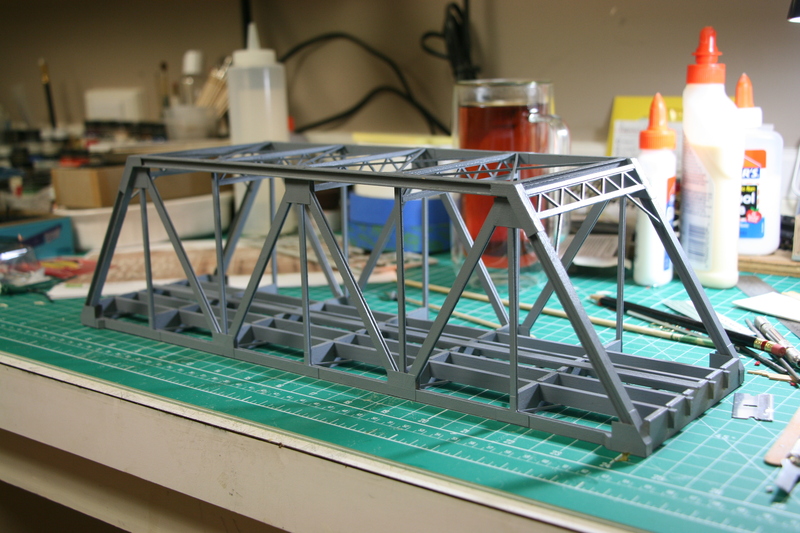 What I did instead was take a styrene web truss, cut off the flange and glue it into the balsa channels. Then I glued them into place. After that, I obviously primed it. After 24 hours I gave it a final coat of flat black. In it’s final color waiting for weathering. Considering that I was working without instructions, I think it turned really nice. Of coarse now I have to cut and fit it into place. And just like the last bridge I added in after the track work was in place, I will have to move the feeder wires first. Well, we are into the last half of March which means it’s been way to long since I last sat down here. It’s not that I haven’t wanted to, I just have not had the time. Also, except for a couple of specific projects, I would have said that I really hadn’t gotten anything done. But looking around the other night I realized that I have accomplished a few things. So, without further ado, lets get you caught up. 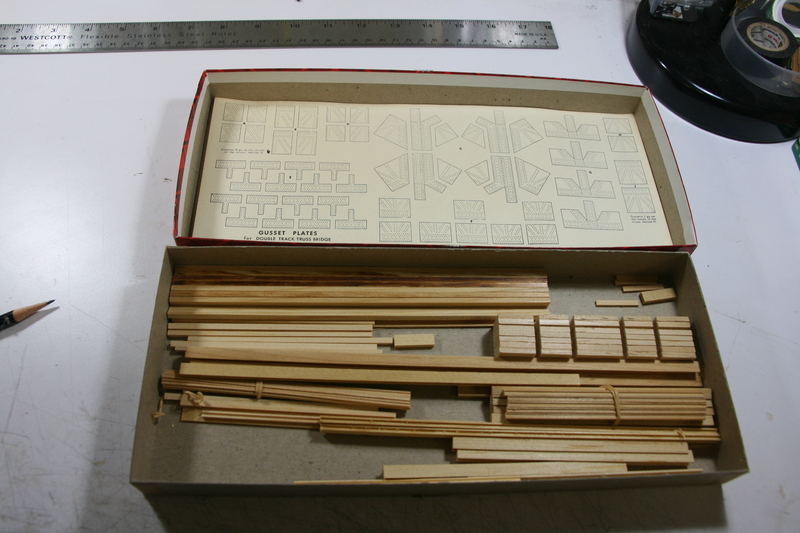 First up is a craftsman kit that I picked up 30+ years ago. It is a Quality Craft Models Kit. Quick history, Quality Craft made kits in HO until about 1980. I had picked this up at a LHS off of their consignment shelf. I had finally got around to finishing up the assembly about 2 years ago. It then went to the paint area where it got pushed to the back. Well, looking for something to do I finally painted it. 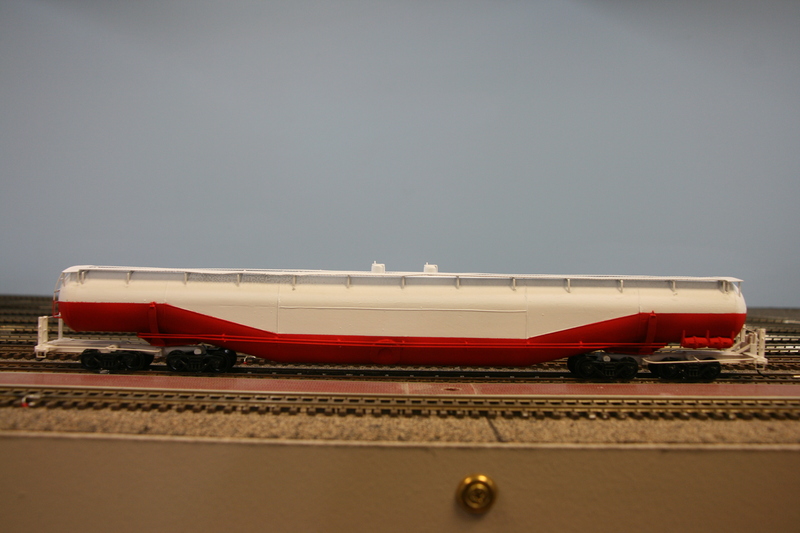 It is a model of GATX #96500. This is a 63000 gallon tank car, commonly referred to as a Whale Belly car. It was 98ft long over the couplers. 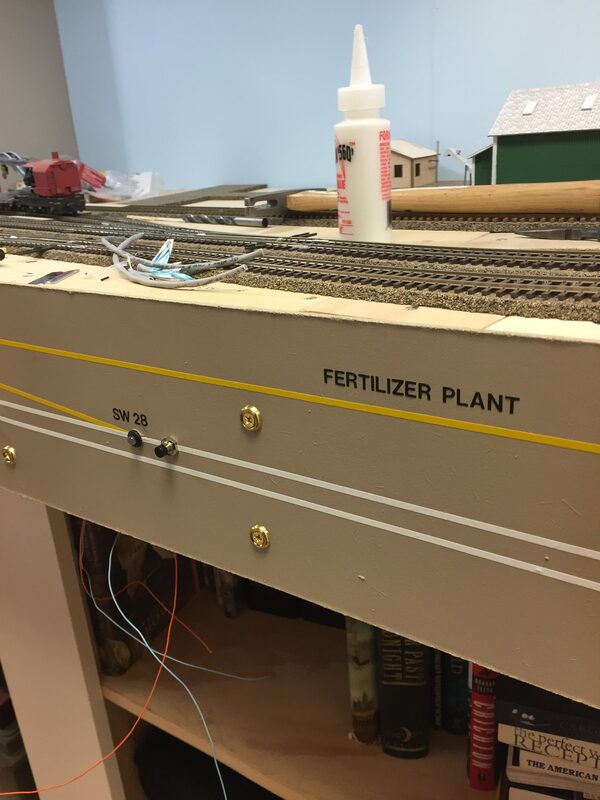 The only commercial plastic kit was made by Atlas in N scale. All that’s left is to decal it. Small problem, I can’t find it’s box or the decals. That is the real problem with a long term project. I’ll keep looking, however if I can’t find them the instructions are full sized. I can scan them and make new decals on my printer. Next up is New Brighton Yard. I Know! Talked about this for a long time. The yard in New Brighton. As you can see it isn’t and never will be a classification yard. 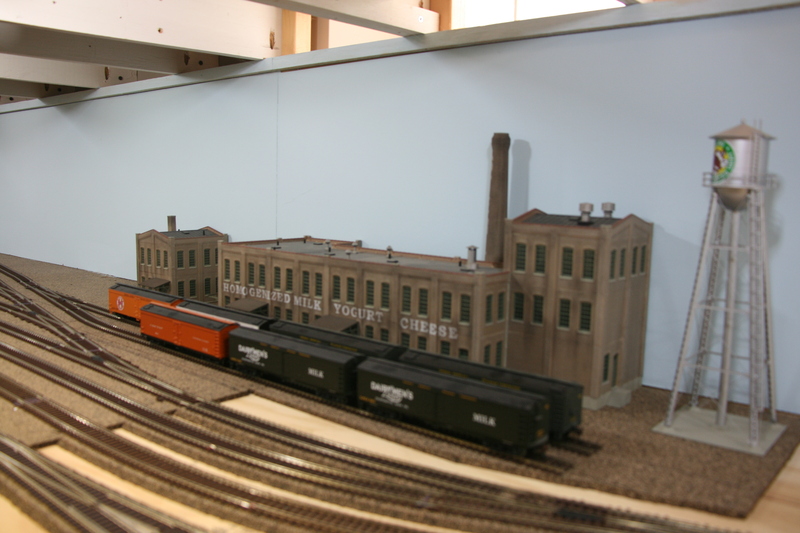 There is the meat packing plant, the dairy, power station and a yet as unidentified business. 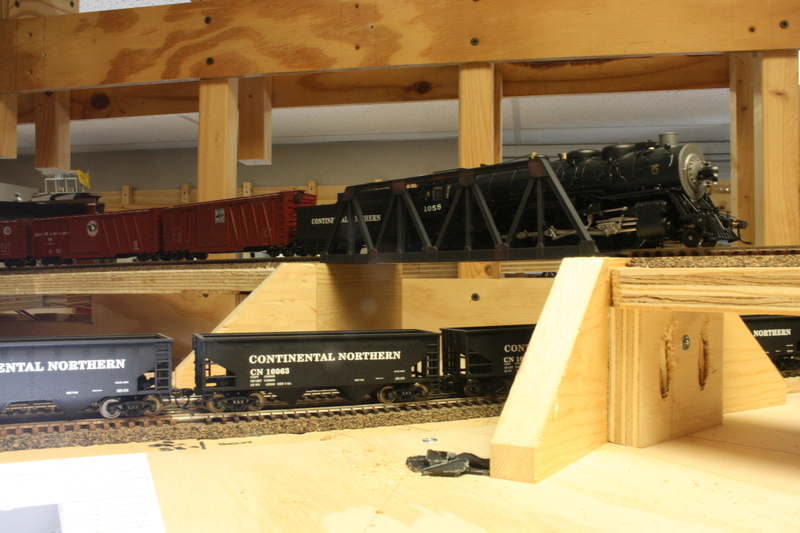 Plus some trackage to store cars on for these businesses. 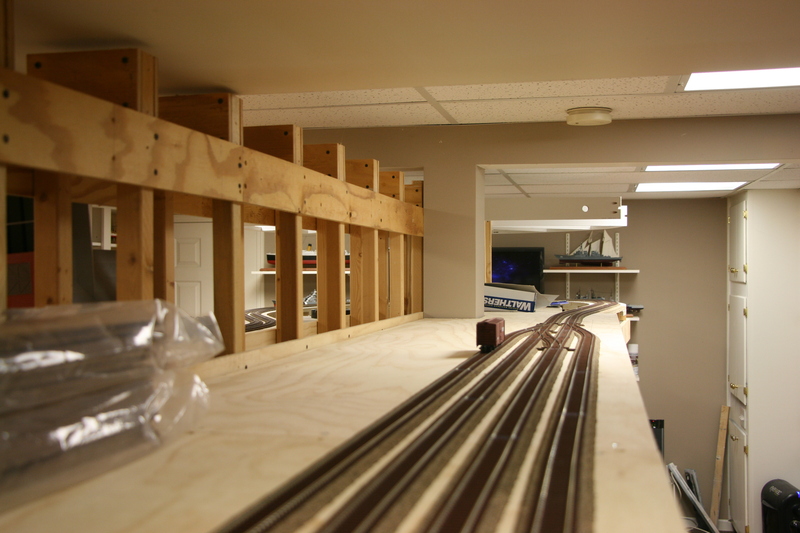 I also finally got the programming track in and wired. It’s next to the staging track lead. The new programming track in the fore ground. Last but not least I continued on with the basic ground cover in Jackson. I am now up to Main Street. Basic scenery done up to Main Street in Jackson. 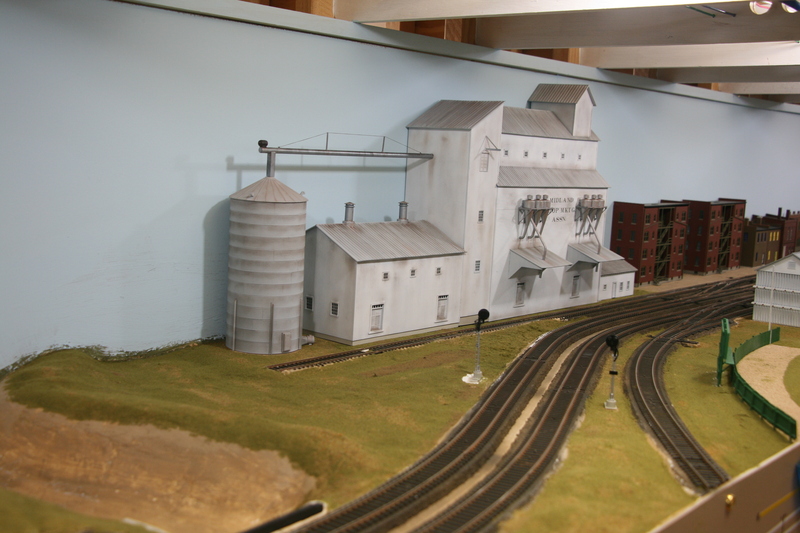 I wasn’t sure what to do with the space up front that is bordered by the front grain elevator and the switching spur. It is a crescent shaped space. Thought about throwing in a crop field of some sort. But looking at it the shape made me think of the outfield of a ball park. Thus, the city of Jackson got their “Town” ball field. If you are unfamiliar with small town baseball, you should find one and go sometime. They are usually very nice ball parks. The games do start later as all the players have to finish work, go home and eat. Then they head down to the park for the game. They are a lot of fun. The new ball field is in. That’s what I have for now. Next time I will cover one of the “specific” projects I had mentioned. The other was an Epic Fail and right now we are not talking about it. Interstate Junction or as it’s also known as “the Junction” exists because of Duluth’s unique geology. Duluth and her sister city, across St. Louis bay, Superior, Wisconsin are at lake level. And while the land south and east of Superior is relatively flat, Duluth is surrounded on the south and west side by a ridge that rises approximately 600 feet. 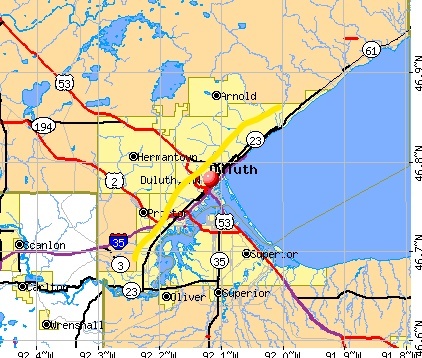 Below is a map of Duluth and the surrounding area. The yellow line that I drew in is approximately the top line of the ridge. From there it’s a pretty consistent slope to the lake. This situation worked well for the DM&IR as they didn’t have to figure out how to push a loaded ore train up onto a 80ft high ore dock. Rather they could ease the train downhill and then pull an empty train back up. The DM&IR”s tracks did come through a cut in the ridge at about the same place as Interstate 35. This probably saved them 50ft of drop. Even then they still had a 2.2% grade to the docks. The Northern Pacific also had a line that climbed Proctor hill from the lake side, but I couldn’t find any information on the percent on the grade or how often they used it. Even the DM&IR’s lake side line came in from Two Harbors, 27 miles to the north. Which brings us to the Junction. Except for NP’s line up the hill and the DM&IR’s line from the north, all other lines came into Duluth from the east/south through Superior, Wisconsin. 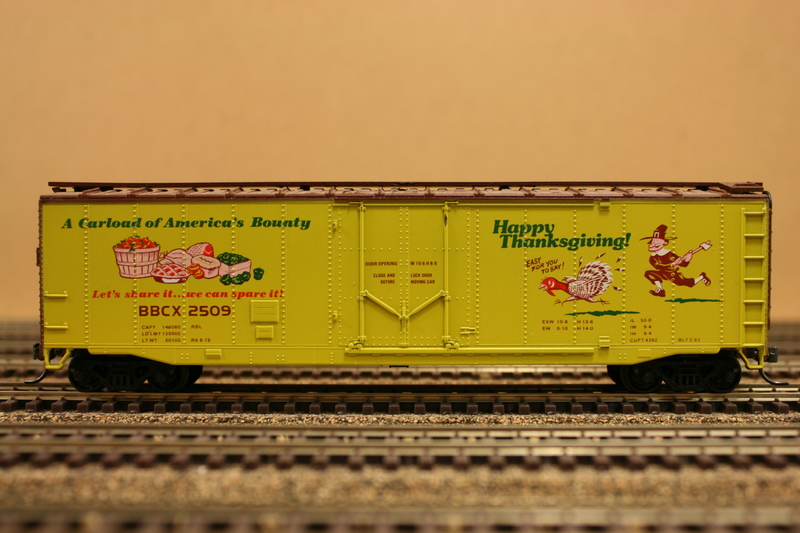 These included the CMO (Chicago, St. Paul, Minneapolis and Omaha), C&NW (Chicago and Northwestern), The Soo Line, Great Northern, Milwaukee Road and the Northern Pacific. 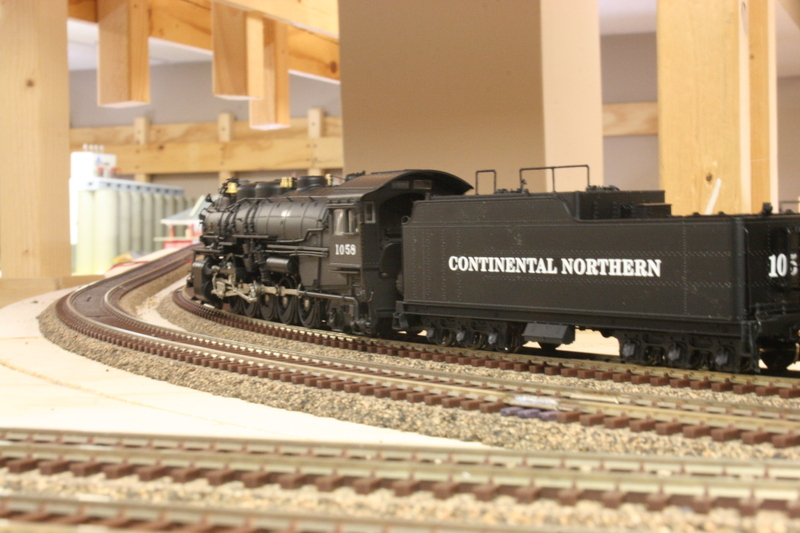 As seen in the photo below, The Northern Pacific, being the first one there was about the only line with a major yard in Duluth. All others are in and around Superior. So the Continental Northern’s line heading north out New Brighton had to swing east into Wisconsin in order to then swing west back into Duluth. The “Junction” is where double track mainline branches. One branch that heads north and then west, while the other heads east, then north to Superior and Duluth. 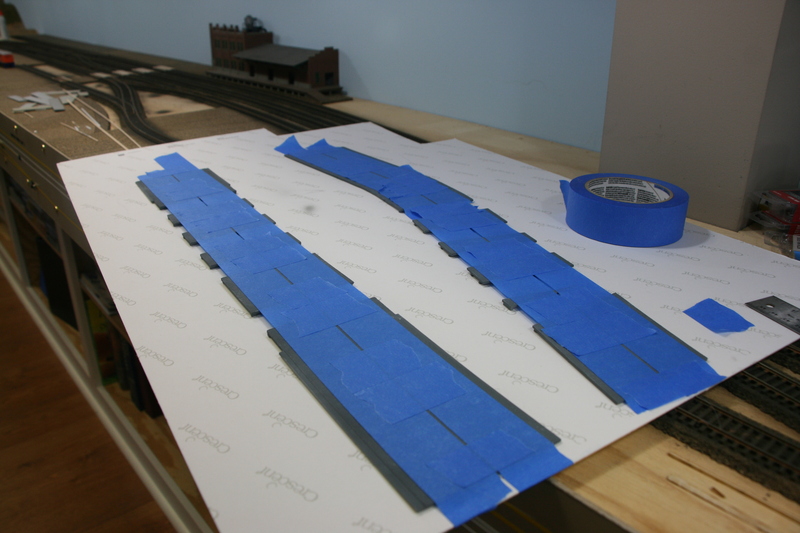 I have the double track mainline as well as a double ended siding for each mainline track. It then becomes an interchange within the railroad. 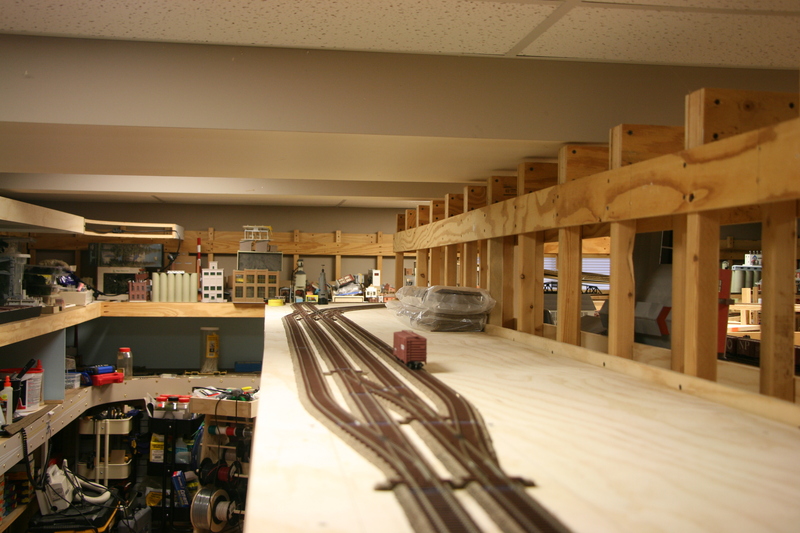 This section of the layout becomes an industry where cars are dropped off and picked up. I did it this way because mid Minnesota industry is mainly farming. How many grain elevators and feed mills do you want. It also means that I can run loads that are not necessarily farm related on this section of the road. After all, a little variety is a good thing. I also realized that in trying to explain all this to you, that I need to come up with a map outlining where the railroad fits into the world. And when I do I will share that with you. 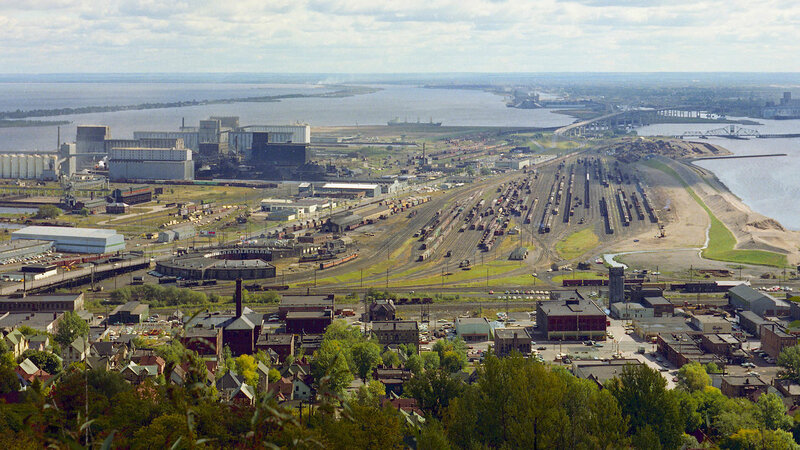 Another thing that I would like to share with you is the variety of industries in and around Duluth/Superior. Most people believe that it was all iron ore. But that is for another day. Yup, I’m back on track. OK, enough with the stupid puns, I promise. I was able to get back out to the garage and get the plywood cut for the subroadbed curve around the end of the peninsula. How was this possible? I was finally able to get rid of the Candy Cart. Insert happy dance here. With it out of the way I have room to get things done now. The cart went away around the end of October. With it gone I shifted into high gear. 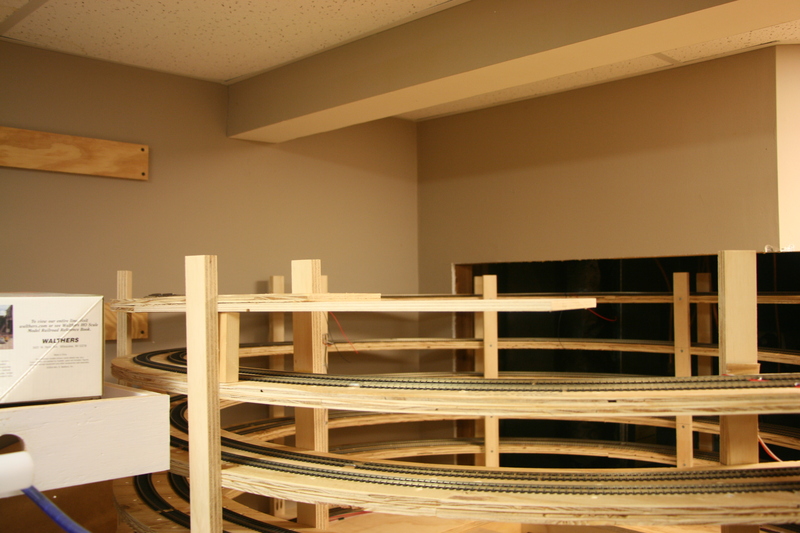 My goal was to have track in and wired on the upper deck up to and including the upper reverse loop by Thanksgiving. That way I could orbit a couple of trains. 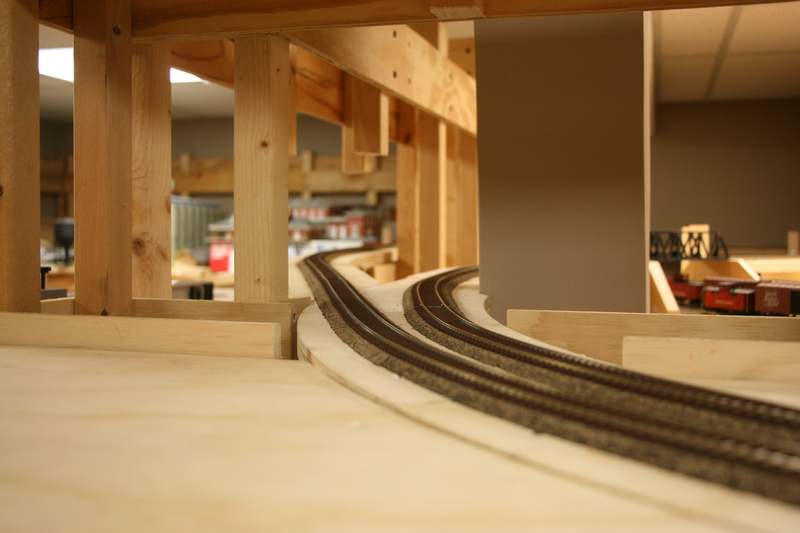 My family loves to see the layout and to see the trains run. However, watching a train run to the end of the finished track and stop just doesn’t cut it. 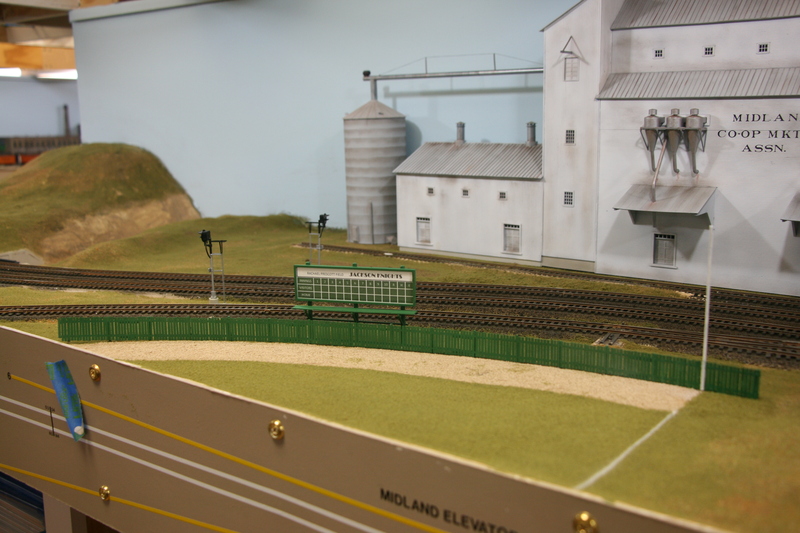 I have learned that unless you’re into model railroading you want to see trains running. Even if it’s a big circle. With that in mind I got to work. 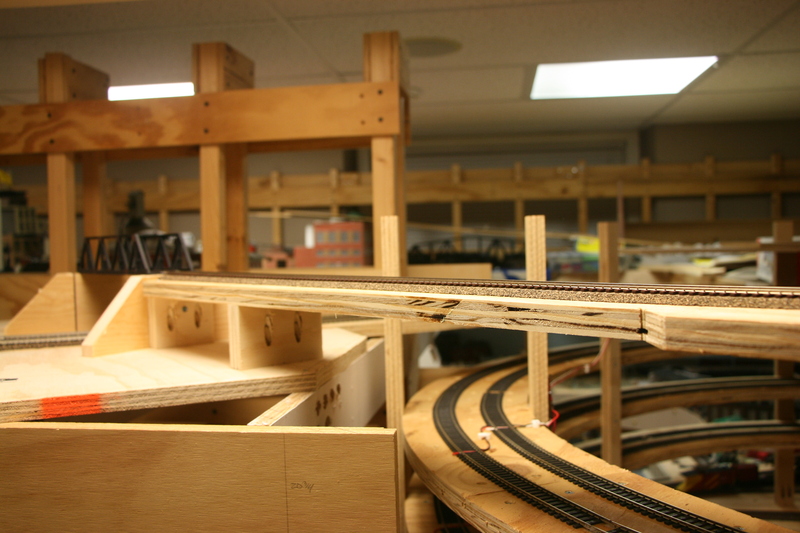 I installed the curve around the end of the peninsula and the plywood for what will be “Interstate Junction”. Side note, I will have a post in the near future explaining the “Junction”. Upper mainline around peninsula end in place. Laying out the “Junction” required working out the return loop first. 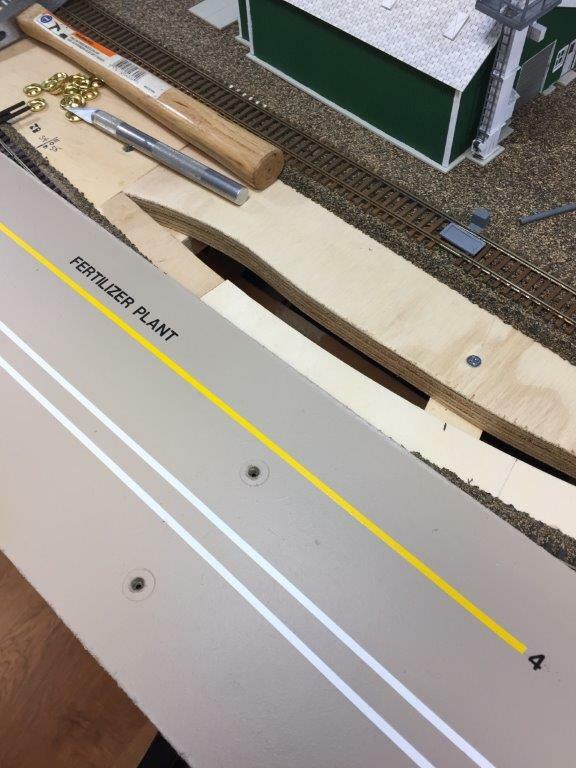 How the return loop lies determines where the track cuts off the mainline. As I had mentioned before, the return loop crosses the mainline as it comes out of the helix. So that is where I started. Upper helix lead. Return will crossover here and hide entrance to helix. 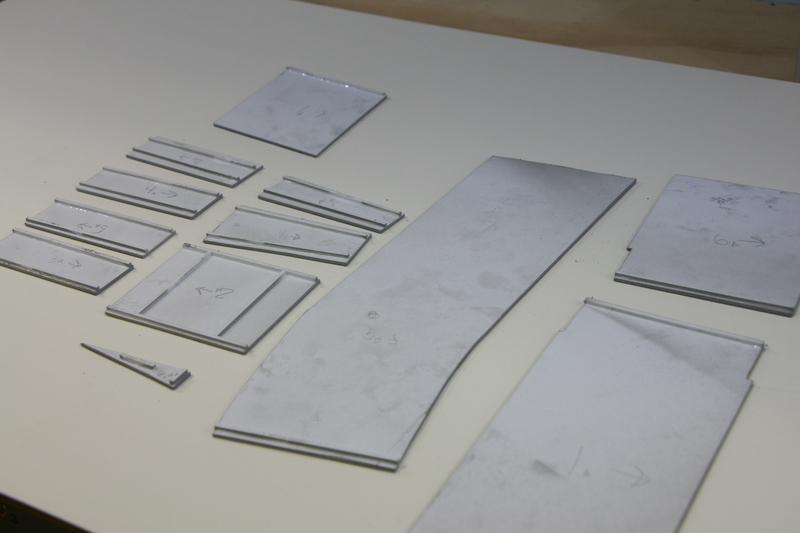 With this laid out I added the support structure for the return loop subroadbed. Planned bridge scene that will hide helix entrance. Return loop over helix started. Longer view of return loop entrance over helix. The plan was for the loop to meet back up just past the bridge to head back out to the mainline. However I had clearance problems. The return loop ended up climbing a bit over the end of the helix. I had to run the loop down the other side of the divider before meeting back up. 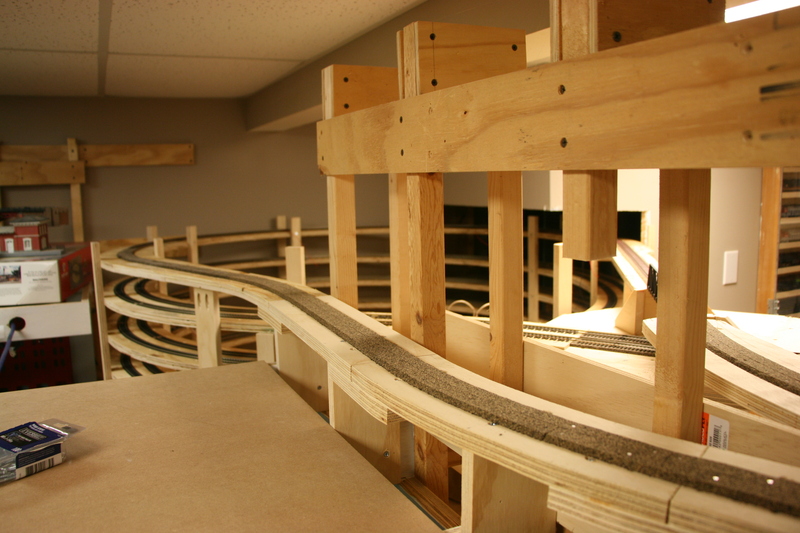 Working on the return loop exit from over helix. Laminating the subroadbed for the return loop exit. 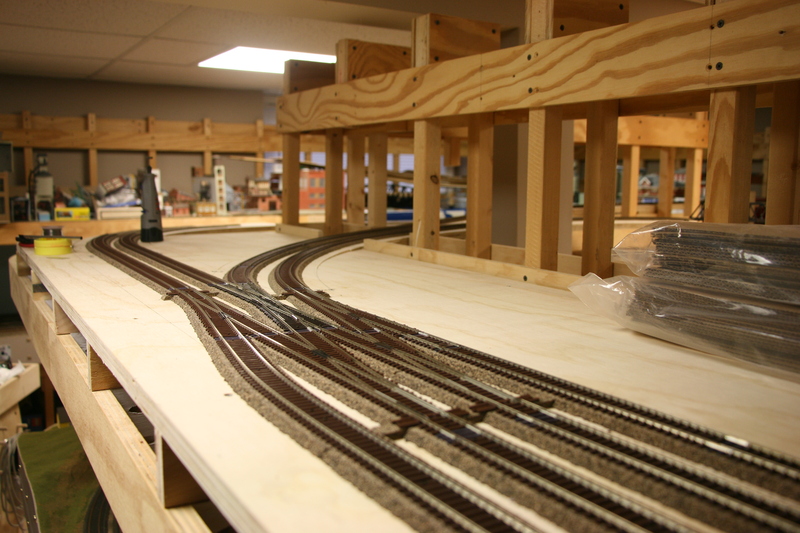 Once I had this part laid out I went back and laid out the mainline track work and where the loop branched off. Working from the junction to the return loop. Approach track from junction to bridge scene. And then it was just a matter of piecing everything together. 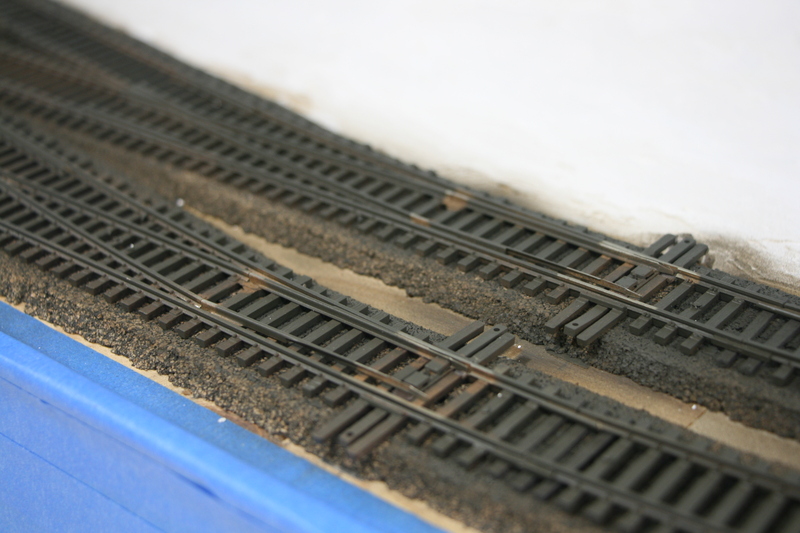 Once done I started adding the cork roadbed. 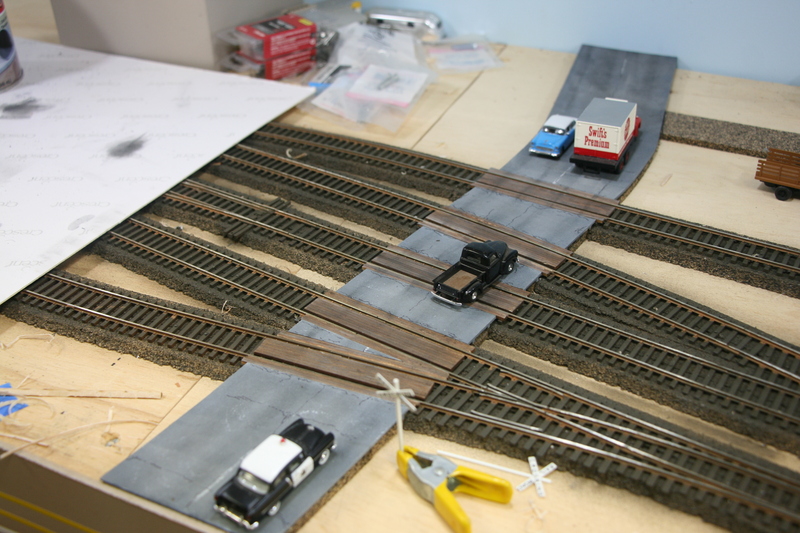 Working on the track placement for Interstate Junction. Cork in place and ready for track. After the cork was in place it was on to the track and wiring. 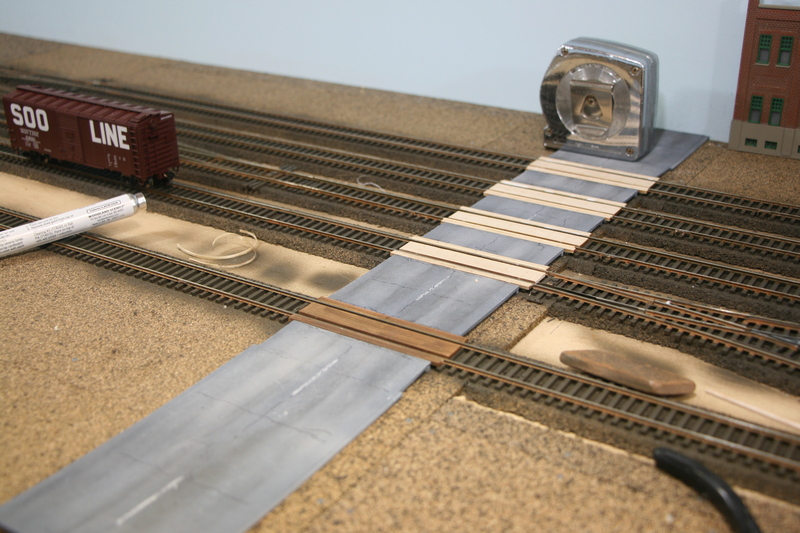 Track in place for Interstate Yard. Closer view of “The Junction”. 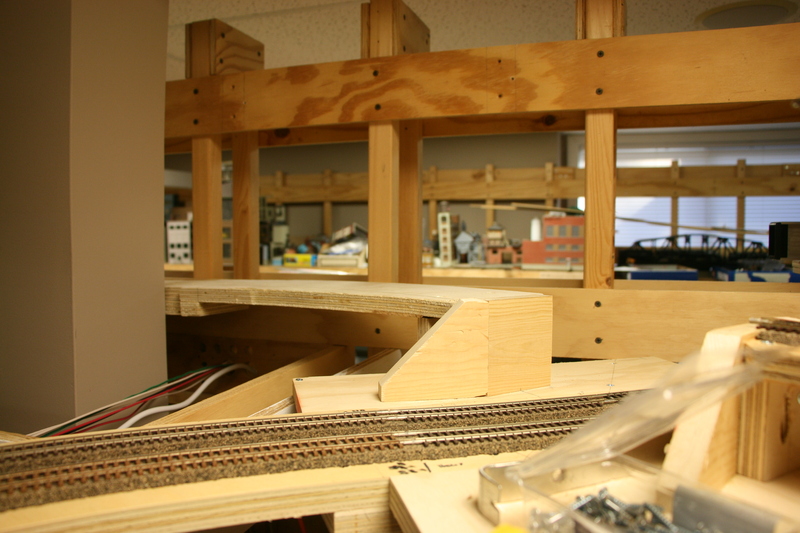 Track work in place for return loop. I have kept all grades (the amount of rise or fall of the track) to 2% or less. Because of the climb over the end of the helix, the return loop drop is closer to 3%. I don’t see this as a problem because trains are traveling counter clockwise and the 3% is downhill. Anyways… once the track was in and wired it was time. First train headed into upper return loop. Around and over upper helix lead. And back out of the loop. I was thrilled to have gotten this done. It has been a long time goal and now I’m there. Of coarse it was not problem free. When I wired in the lower return loop with the Digitrax (digitrax.com) AR-1, the return loop worked flawlessly. With the second wired into the upper loop I now have a problem. 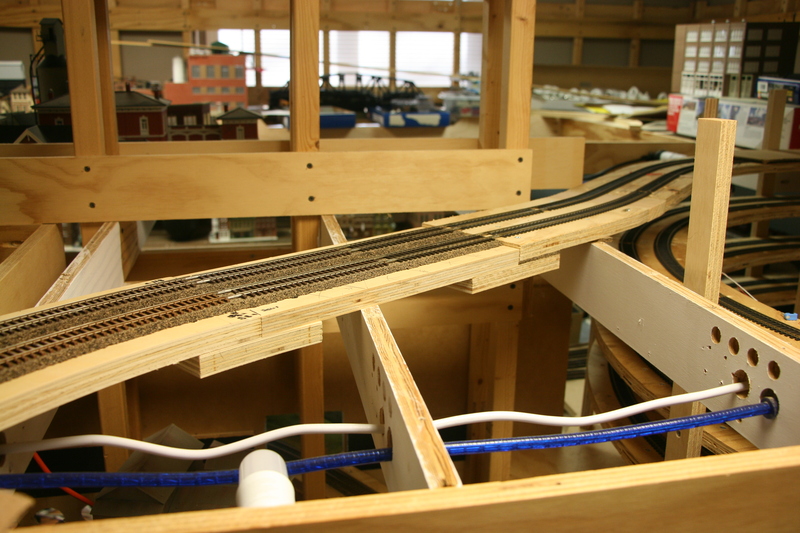 The first train entering each return loop (upper and lower) trips a breaker, pauses and then goes on. After that no more problems. Only thing at this time I can think of is to tweak the trip current on the AR-1’s. AND this was all done Thanksgiving Eve. Trains ran beautifully on the big day. With this done, I’m now able to let the trains run. Where this is important is getting all the engines out and running. They’ve been in storage for way to long. I’ll be able to see which are fine and which will need some TLC. As I had mentioned in my last post I wanted to keep going with the basic scenery. In order to do this I had to get the streets in Jackson in place. In the past my streets were simply styrene plastic painted and weathered. I decided to take it up a step. 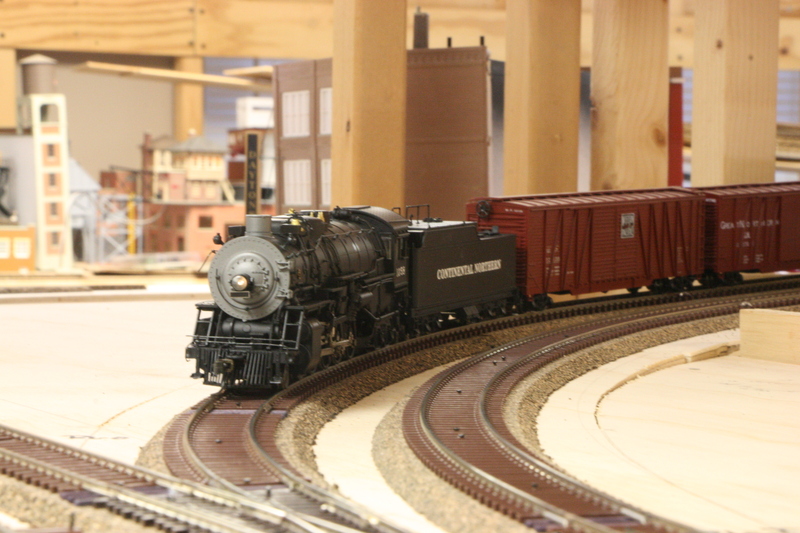 One of my sources of inspiration is Model Railroader’s Video Plus(mrv.trains.com). And one of their contributors is a personal favorite. Fellow Twin Citian, Gerry Leone. 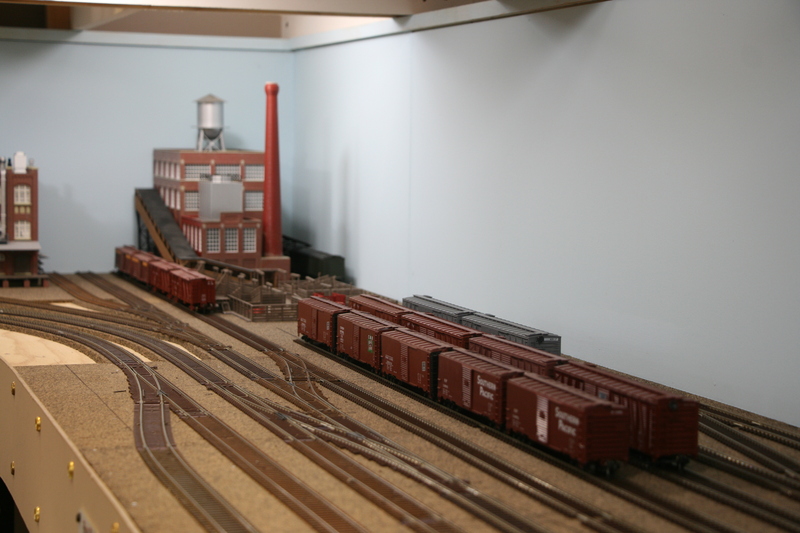 Gerry is a long time contributor to Model Railroader and now MRVP. 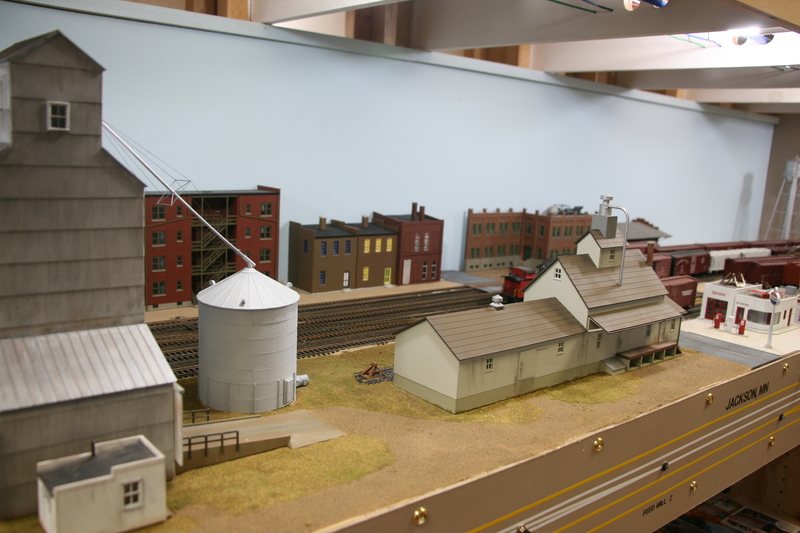 His Bona Vista Railroad has been featured many times in the magazine. Anyways, one of the videos he has done is a two part series on making roads. The main difference between the way I had been doing it and Gerry’s method is that he glues 100 grit sandpaper to the styrene. 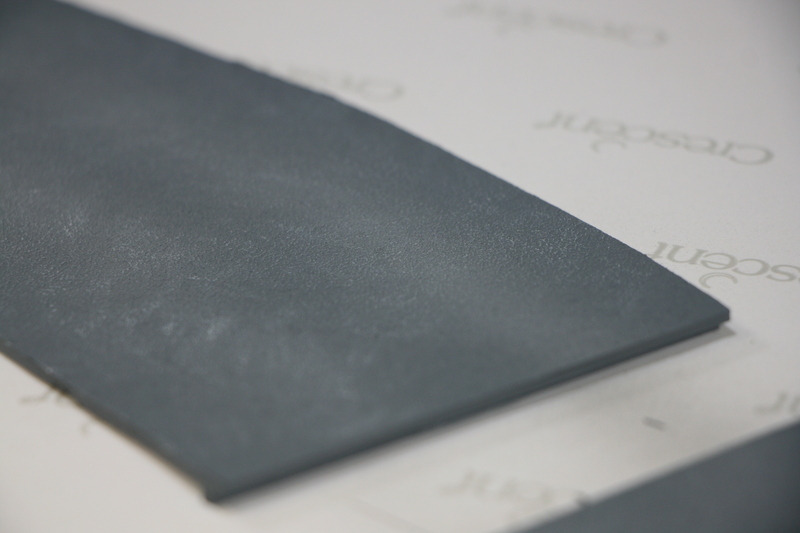 The end result is that you have a very nicely textured surface when done. If you would like an in depth description of the process I would suggest watching the videos, otherwise I will do a quick recap with pictures. I was adding two streets to the scene. Both ran from the front to the back. Because of their location, both streets cross five tracks. 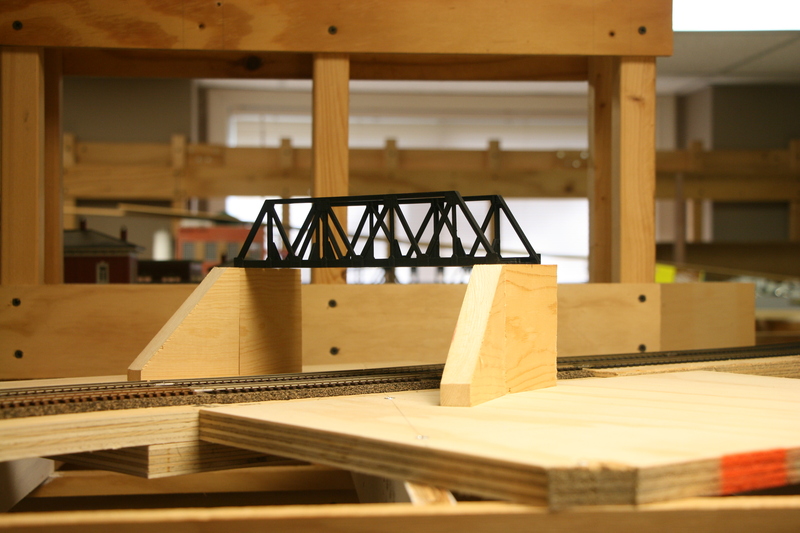 The first thing to do was to install Blair Line (blairline.com) wood grade crossings. Getting ready to build a road. 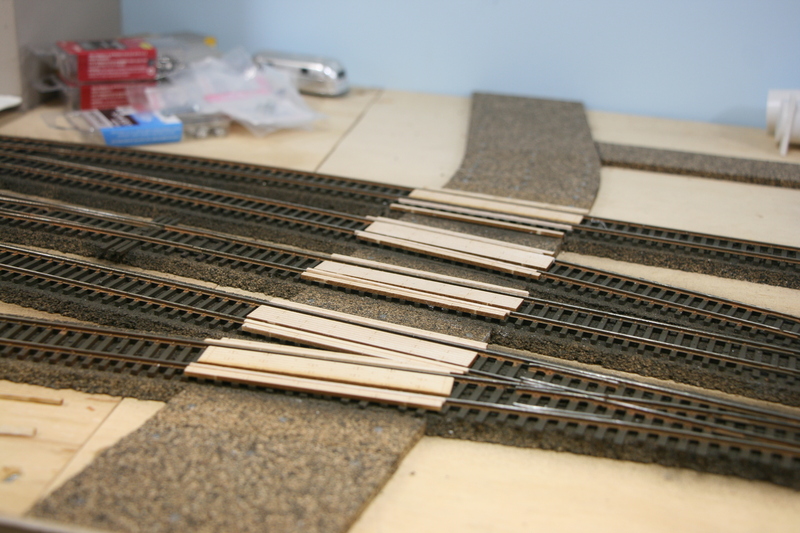 timber crossings in place. The street prep for the main street crossing in Jackson. 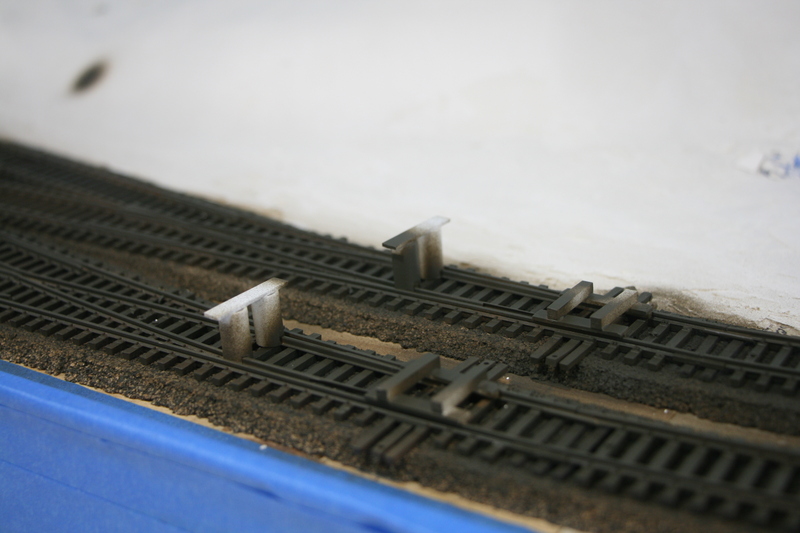 After they were in place it was a matter of cutting the styrene road pieces to fit in between. 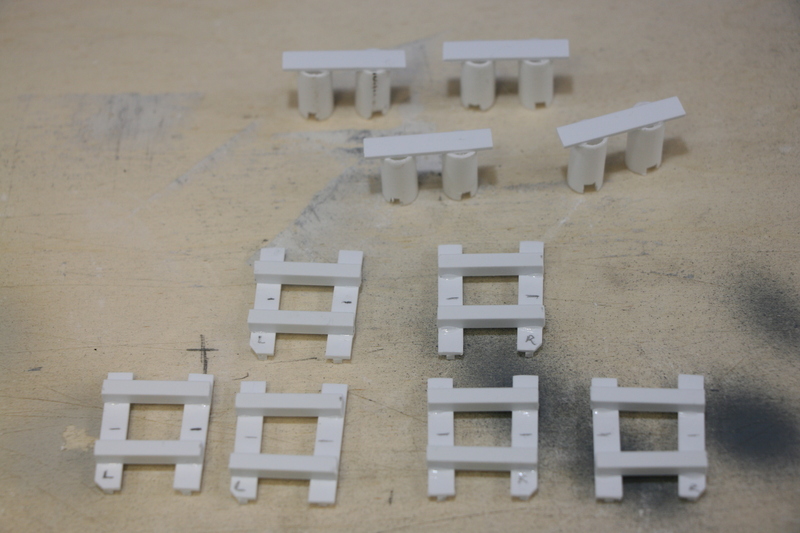 I had to add styrene strips to the back to bring them to the proper height. Primed the sections. 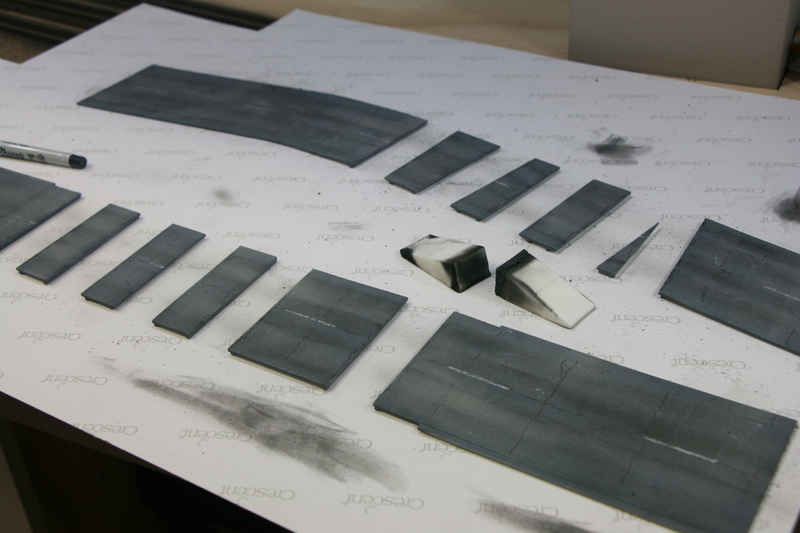 Airbrushed the base asphalt color (Tamiya – Medium Grey). Airbrushed a lighter grey for contrast. Masked and then added center stripes. Added cracks with a fine point Sharpie. Added a little more weathering and then installed. In the pictures below you will notice that I had mounted the sections in order with proper spacing on a piece of cardboard. This was done so that all weathering / striping / whatever remained consistent. Backside of the asphalt sections showing the spacers to get the to the proper height. All number so that I don’t screw them up. The asphalt sections. 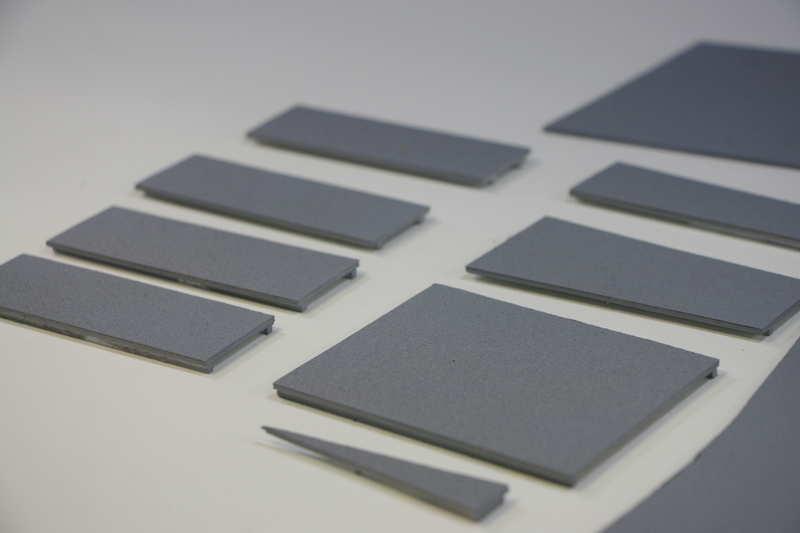 Styrene plastic with 100 grit sandpaper glued to it. Painted. Close up of the asphalt sections. The texture does resemble a older tar road. 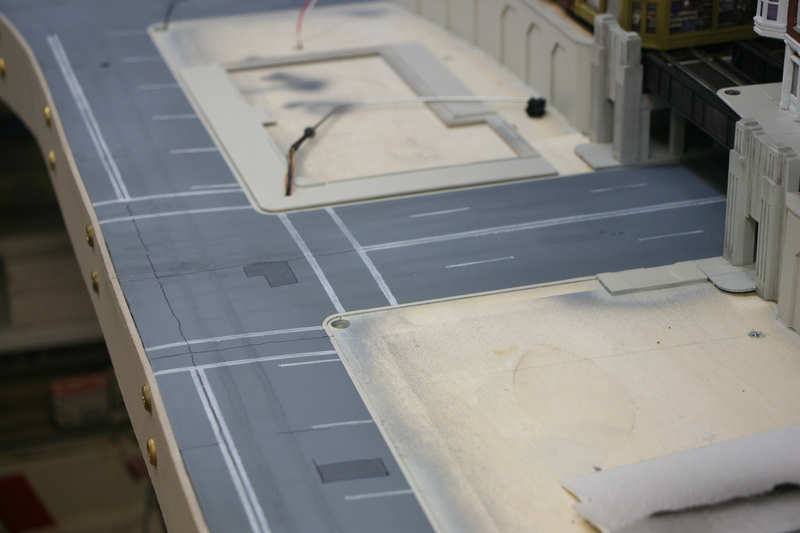 Dry brushed a little white on to the street to pick up some highlighting of the grain. 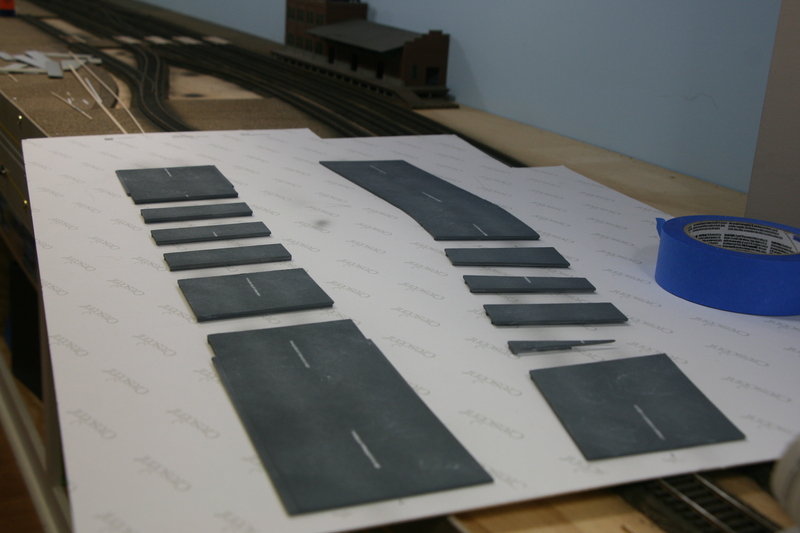 The street sections glued down in proper order with correct spacing. Final asphalt color applied. Dry brushed on white paint for the stripes. Center stripes painted. This is why the proper spacing. 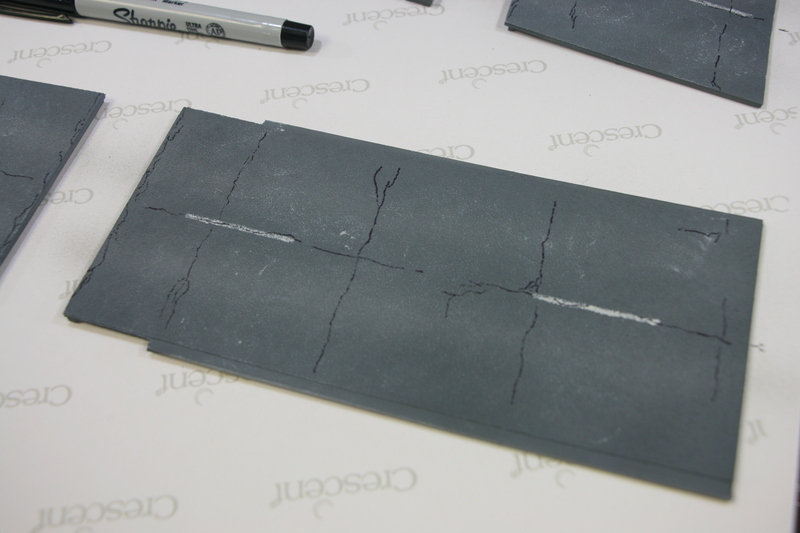 Adding the patching for cracks. Last step before installation. Adding various weathering colors. And the street in place. Jackson Main street in place. Also while I was at it I finished the streets in New Brighton. 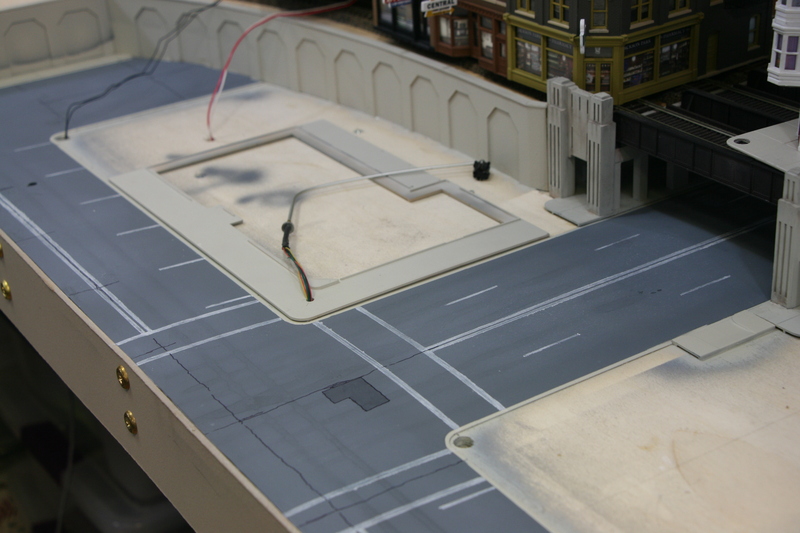 Also finished the streets in New Brighton. A closer view of New Brighton streets finished. A side note. The patches on the streets are for real. The masking tape lifted some of the paint. Instead of trying to match the paint I used darker grey to give the look of a fresh patch. That’s it for now. Next time we’ll get back on track. 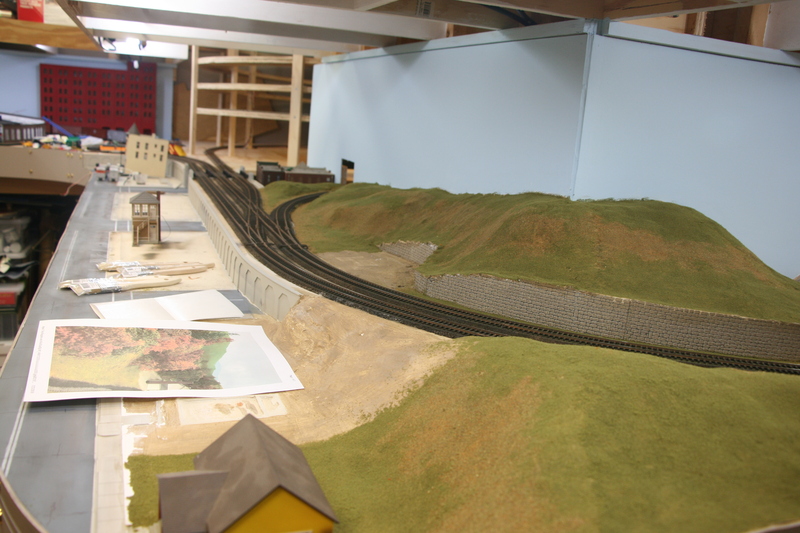 After the track was painted and the tops of the rails wiped down, it was back to the actual base scenery. And the base scenery was all I am trying to accomplish at this point. What started this was wanting to keep busy and get things done that moved things forward. 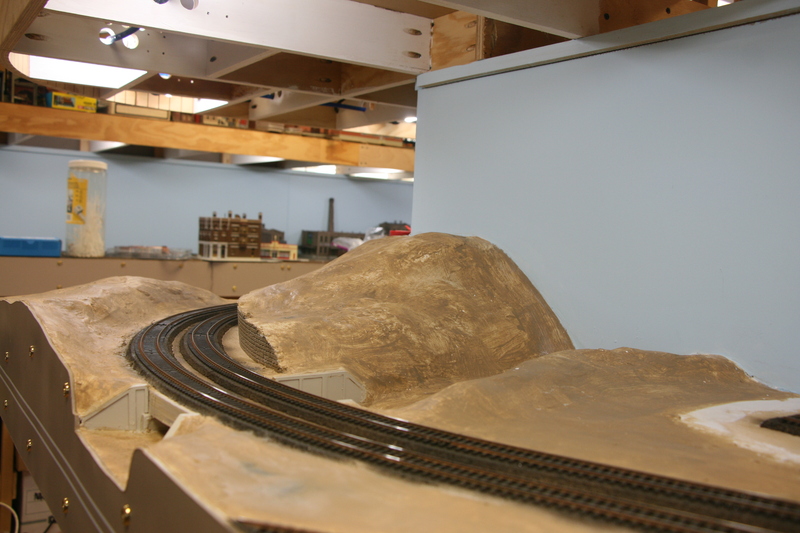 To this end I had got out episode one of Model Railroaders Dream, Plan, Build DVD series. I had subscribed to it when it first came out, which was while a was building my last layout. The first disc arrived just as I was putting the backdrop up. And one of the instructional pieces was backdrop painting. 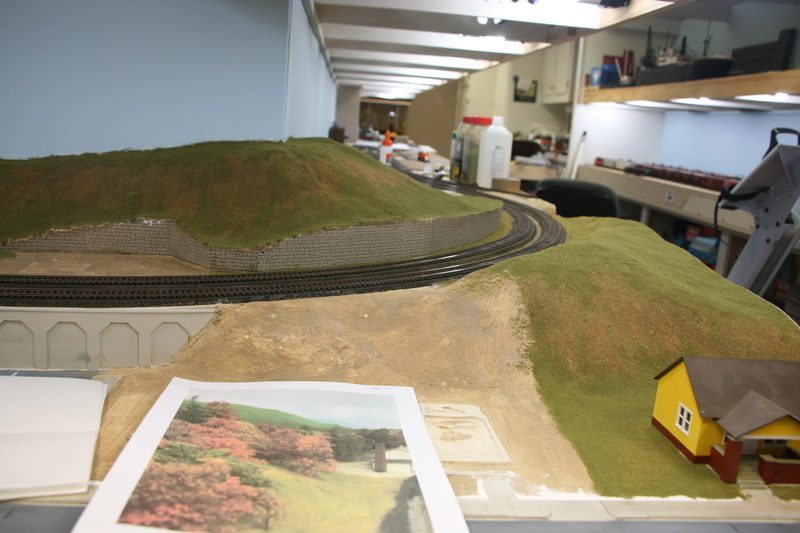 My initial plan was to paint the backdrop on this layout first and then add ground cover. When I watched the video, they had the ground cover down so that they could match the background color to it. And that is why we are at where we are at. I had stopped by one of the big box stores and hit their “oops” paint section. I was looking for a brownish or a brownish green color to cover the white plaster. Found a quart can of a light brown for a couple of bucks. Perfect. The guy working the department walked buy and asked if I needed help. Told him no, that I had found what I wanted. He looked at the can in my hand and said “that is some cheap paint”. I looked back and asked “you mean the price or the paint?”. He just said “Yup”, and turned and walked away. Well, he was right. If I was trying to paint a room with the stuff, I would have shot myself by now. but since it’s for the layout it’s fine. As you can see in the pictures, the white plaster is barely covered. This is with several coats of paint. Again, for what I’m using for, it works. The plaster in with a base coat of paint. Better sense of what it will look like done. 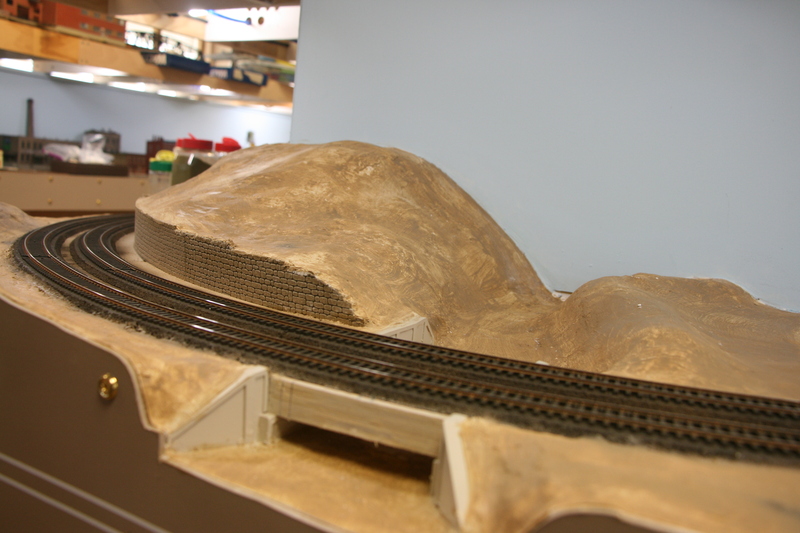 Plaster landform with a base coat of paint. With the paint down it was on to the base ground cover. My method for this is simple, spread white glue with a brush, hit it with the various ground covers and let it dry. Then vacuum off the excess. View down the berm scene with the first layer of ground cover on. working on the first layer of ground cover with a little inspiration in the form of a picture of a finished scene. The first layer of ground cover extended around the corner. As you can see I didn’t finish the yards around the houses yet. I had planned on dirt driveways but think I may need to go back in and add asphalt driveways before the grass goes in. Even the base layer is a huge improvement, so I decided to carry it all the way through the town. So I have to get the rest of the plaster base down. Which means I will have to get the roads done first. And that is where we will pick up next time. Hello and welcome to this, my October Update. 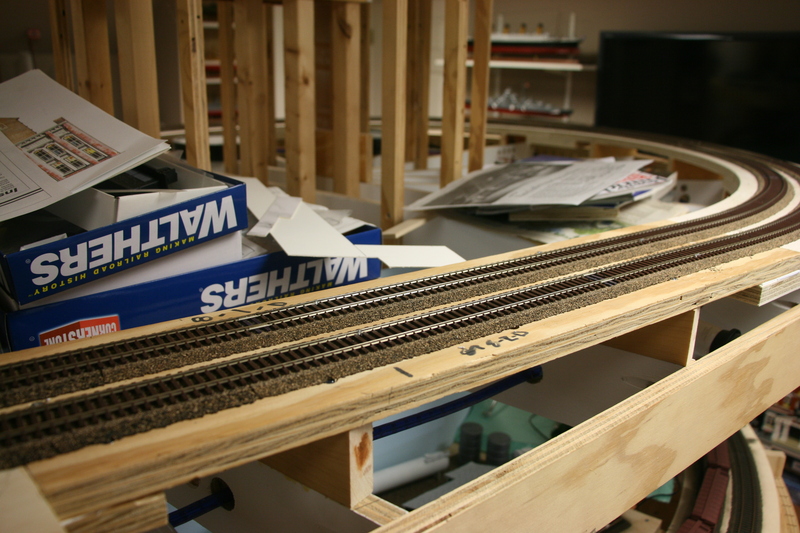 Life has been pretty crazy since I last caught you up as to what I had accomplished on the layout. I’ve been really busy with a variety of things, but still have had time here and there to work on things downstairs. 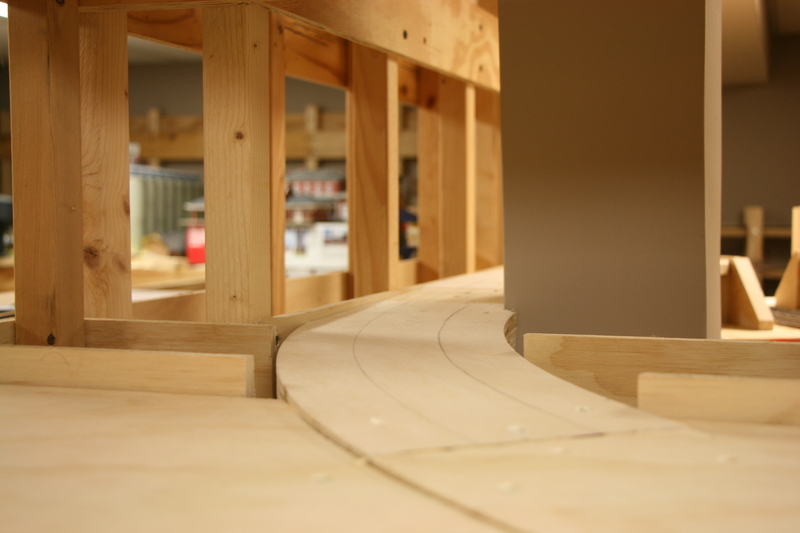 After finishing the switch project and not having had a chance to cut the curved sub roadbed pieces, I looked around at “what’s next”. What I came up with was… back to scenery. 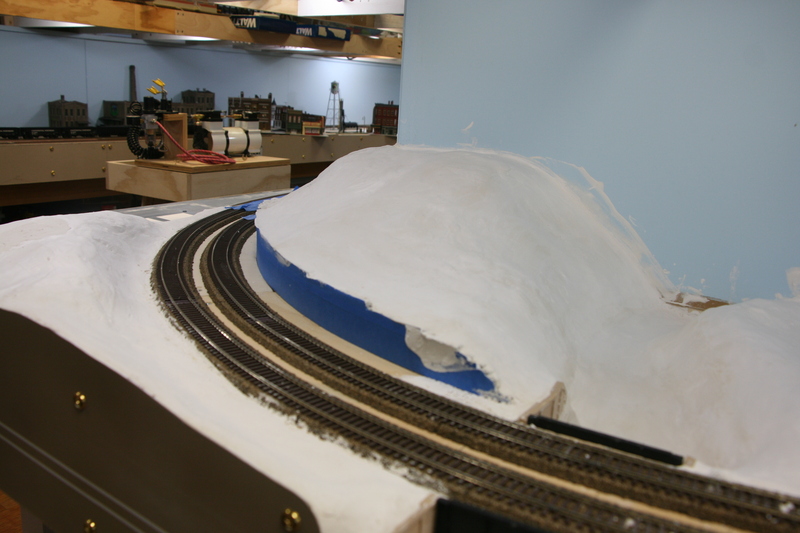 As you may recall, possibly not as it was a year ago, I had started some plaster work between the berm scene and Jackson. 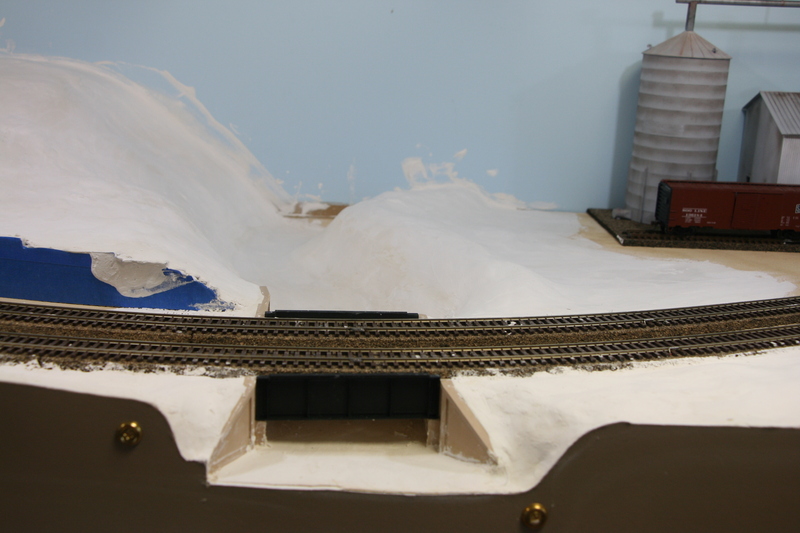 I had put in the landform and one coat of plaster cloth. So the first thing was to put a finishing layer of plaster down. Like I said, I’m pretty old school. The start of scenery, first coat of plaster. Plaster coat around the corner. 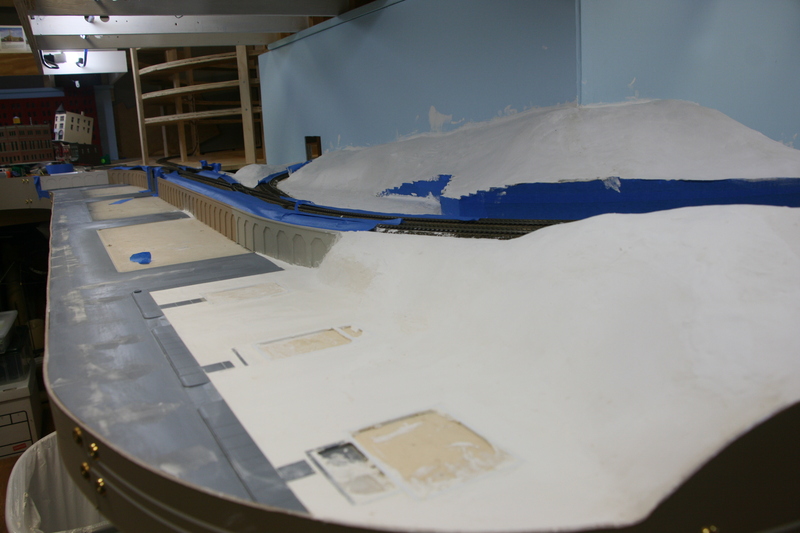 And the river scene is plastered. As you can see in the first photo, I had put in foundations for the houses before the plaster. 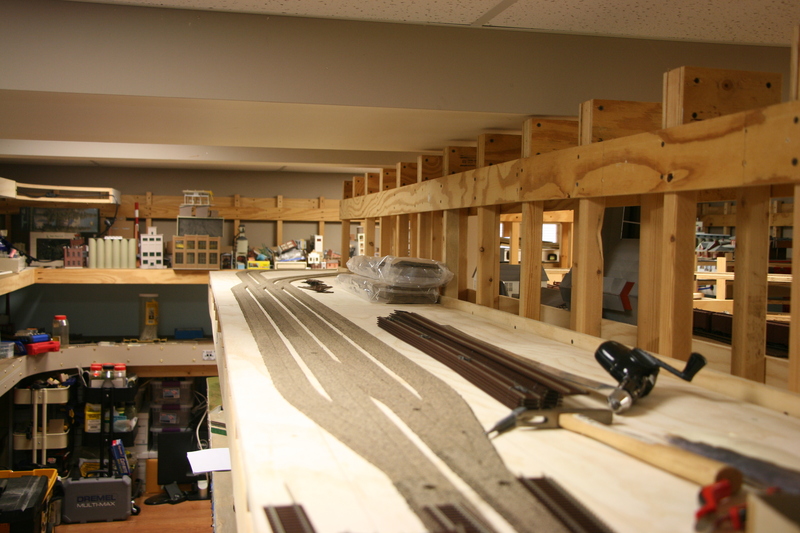 Next step was to paint the track. On one of the forums a guy had pictures of switch point masks that he had 3D printed. Looking at the picture, they were pretty straight forward. So I made a set out of styrene strip and tubing. Track painting switch point masks. 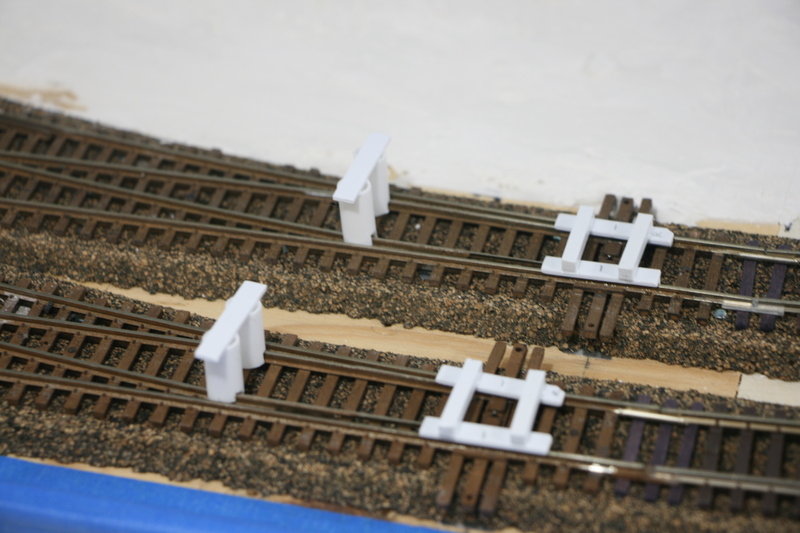 Switch point masks in place before track painting. The track painted, masks still in place. Painting masks pulled, will need to come in with a paint brush and touch up. After this I just come in with a paint brush and touch up the places that need it. All in all they work great, paint one area, pull them and use them again. The color I’m using is Model Master (testors.com)acrylic – Railroad Tie Brown #4885. 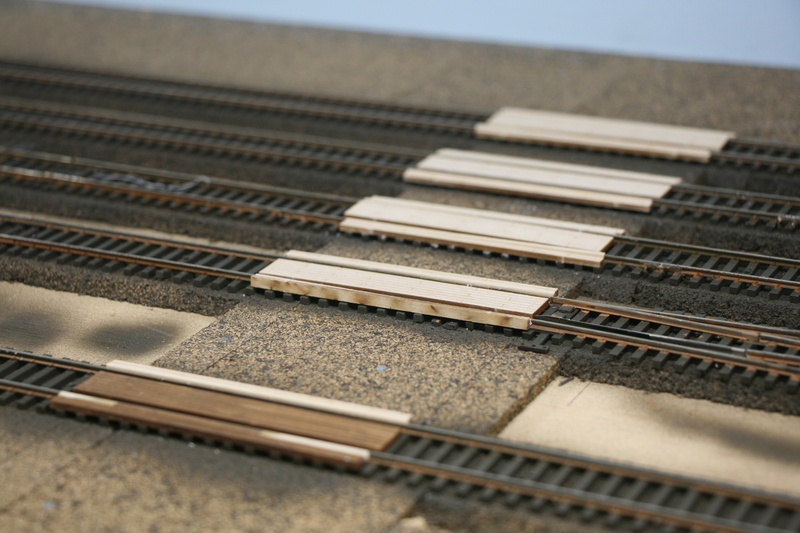 I then hit the rails with Woodland Scenics (woodlandscenics.com) Tidy Track paint marker “rusty rails”, part # TT4581. I had tried Testors CreateFX Rail Brown paint marker and though it’s a great rail color, it is too close to the tie color. And for now this is where I’ll leave you. Back soon with a further update. Since I have the switch machines installed, wired up and programmed I thought I was set. 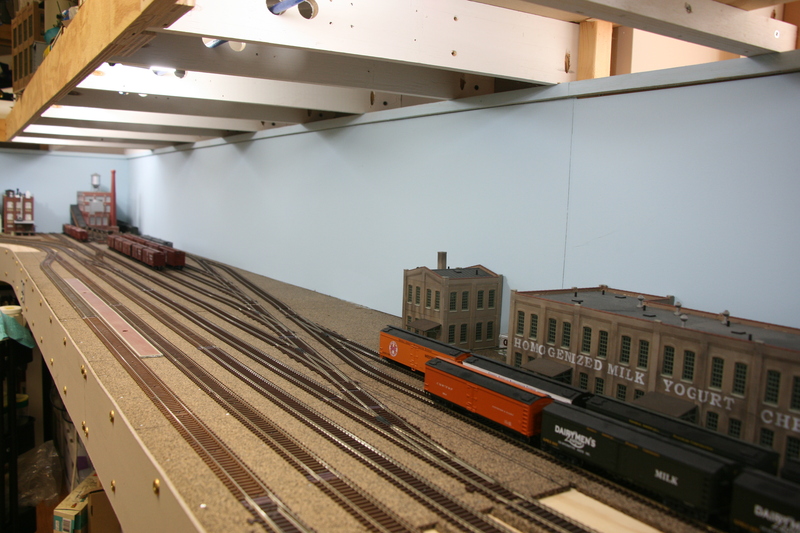 Using my new found power to throw switches on demand, I was feeling pretty good about all the crawling around underneath the layout hooking them up. Went to grab another local freight from the staging yard and found I had a problem. Digitrax’s (digitrax.com) DT throttles are full function. Their UT (utility) throttles are not. Which means that an operator, usually the yard operators, are unable to throw a switch from their throttles. Not wanting to scrap the UT throttles and replace them with DTs (hello, they are expensive) I was going to have to do something. Turns out that “something” isn’t that difficult. My plan has been to use the fascia as a “kind of” control panel. 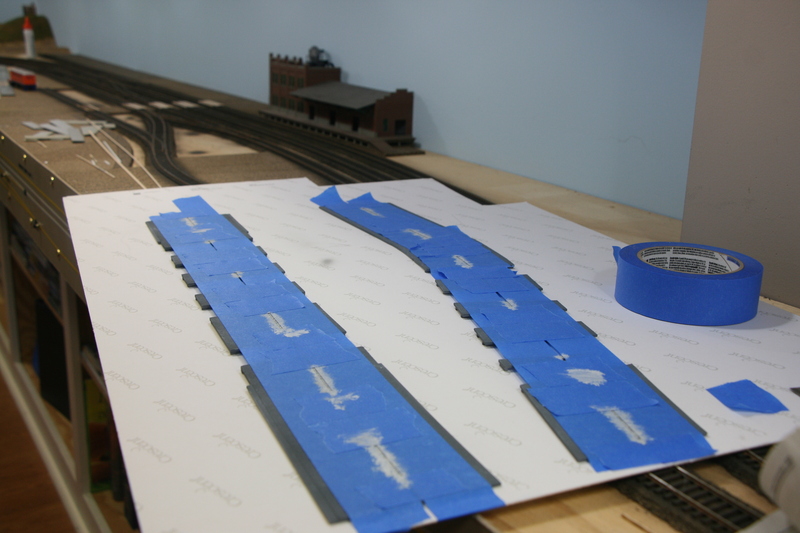 Like I had done with the staging yard, the towns will be laid out with striping tape. 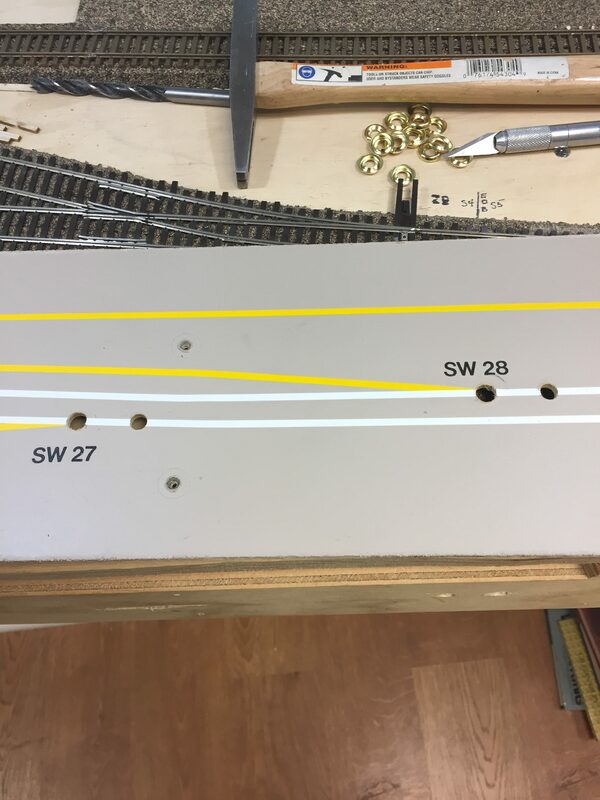 White for the main lines and the sidings in yellow. Industries will have their names and car capacities labeled. The number for the switches would also be by the turnout. Also kicked around adding LEDs for turnout indication. The plan was to do this as time permitted. But the need for a way to control the turnouts locally moved the project front and center. 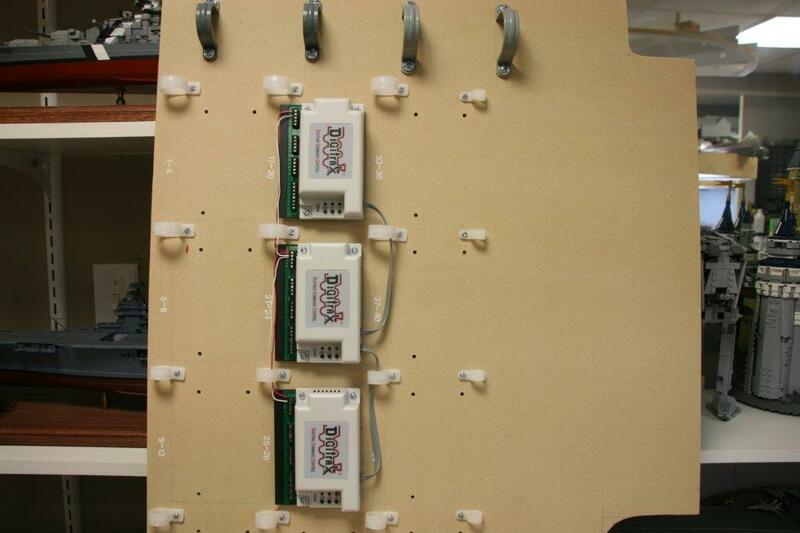 In addition to the above I added a momentary push button switch to the panel at each turnout location. The DS 64s have additional input capabilities for just this situation. Of coarse this meant pulling more wires. but one does what needs to be done. And actually with the roll around wire rack this really isn’t work, just time consuming. Fascia with industry labeled. Track capacity number is also on the fascia. Fascia with the switch numbers in place. 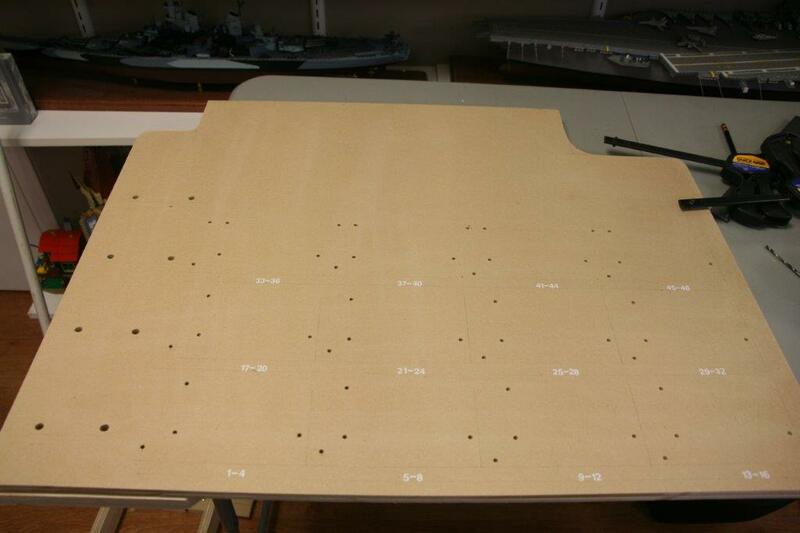 Holes for push buttons and LED indicators. 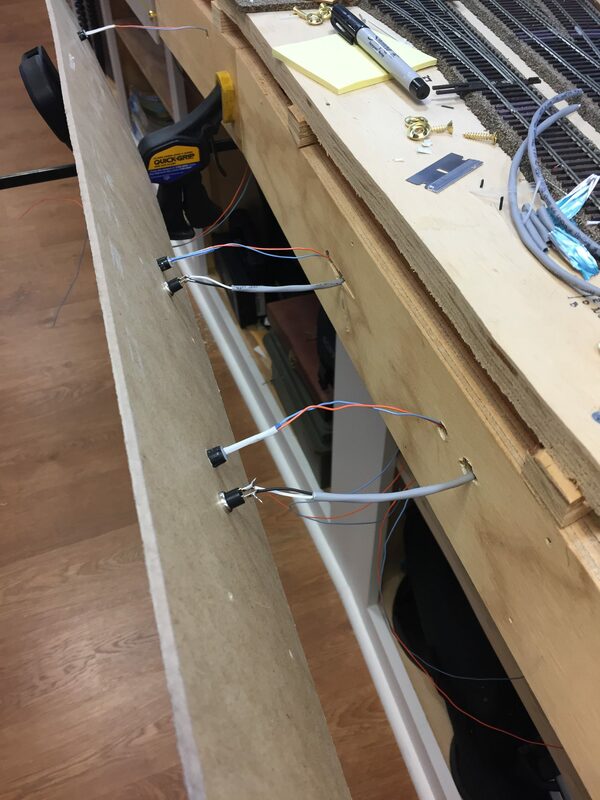 Fascia going in place, push buttons and LEDs installed. Don’t have a shot of them lit up (the LEDS, not me), but I will try and get one for the future. The LEDs are powered through the DS 64 and the red (for a thrown turnout) is not as bright as I would like, but the green is. And when you are rolling through town with a hot freight green is what you’re looking for. If I wanted to as a future project, I could rewire the LEDs through the extra contact points on the switch machines, but for right now they are fine. So Jackson has it’s switch machines in place with control from either the throttle or the fascia. For right now its a lot of fun switching the town, though I’m sure that it wear off after a bit. Which is a bit sad. 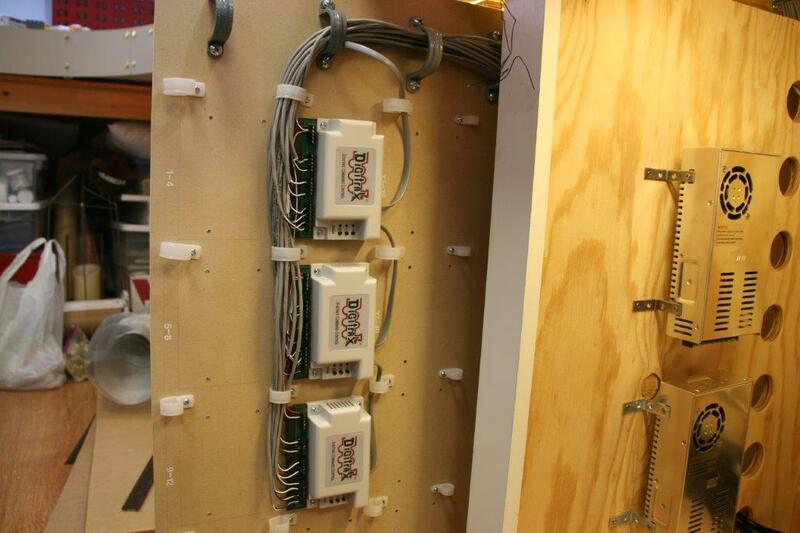 Having installed the switch machines, it was now time to add power and control. 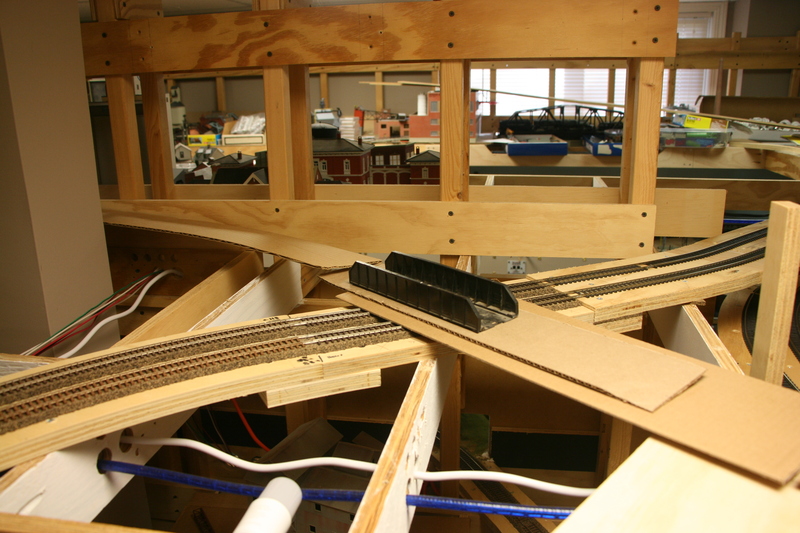 As I had mentioned before, on the last layout I only used the DCC system for locomotive control. When I started this layout I was determined to use more of is capabilities. That means the switch machines will be controlled from the throttles as you walk around. So to do that meant the installation of Digitrax’s (digitrax.com) DS 64 stationary decoders. Not a big deal, as I was collecting switch machines I was also collecting DS 64s. They are mounted in the electrical cabinet (if it’s electronic , it’s in the electrical cabinets), the initial question was how. If I mounted them on the back or side wall, access for wiring, programming and maintenance would be a hassle. The solution (and my original plan that I wasn’t sure would work) was slide out panels. That way I could pull the panel out and sit in the aisle to wire or whatever. I cut the panels (I made two) to size. 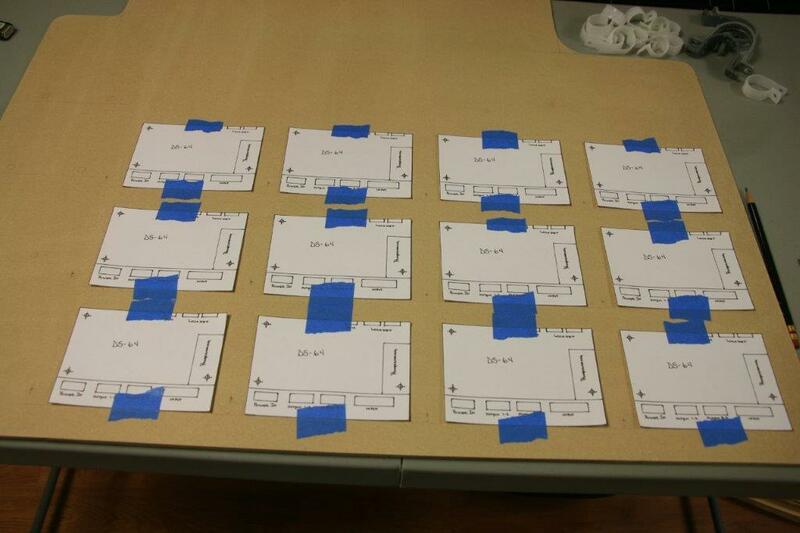 Using templates of the DS 64s I laid out placement. Then added in where the wire runs would be and added in cable holders. 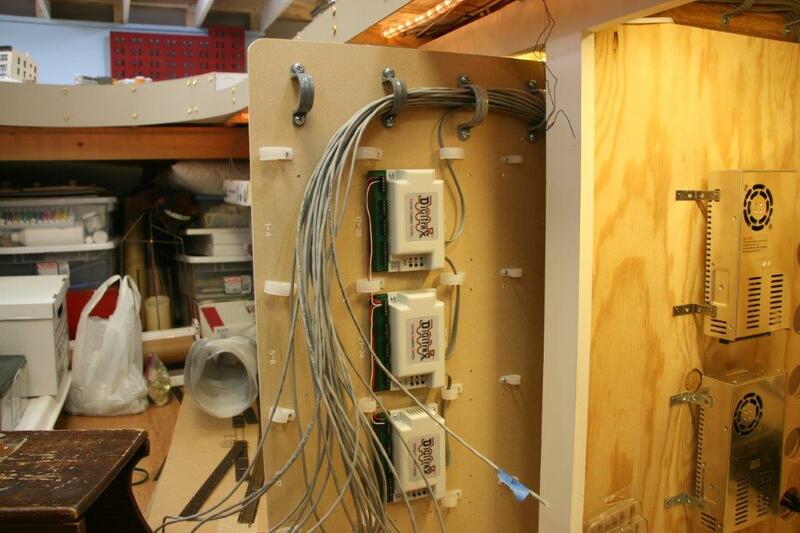 Laying out the panel with decoder location and wire looms in place. Panel for the switch stationary decoders ready for the DS 64’s. 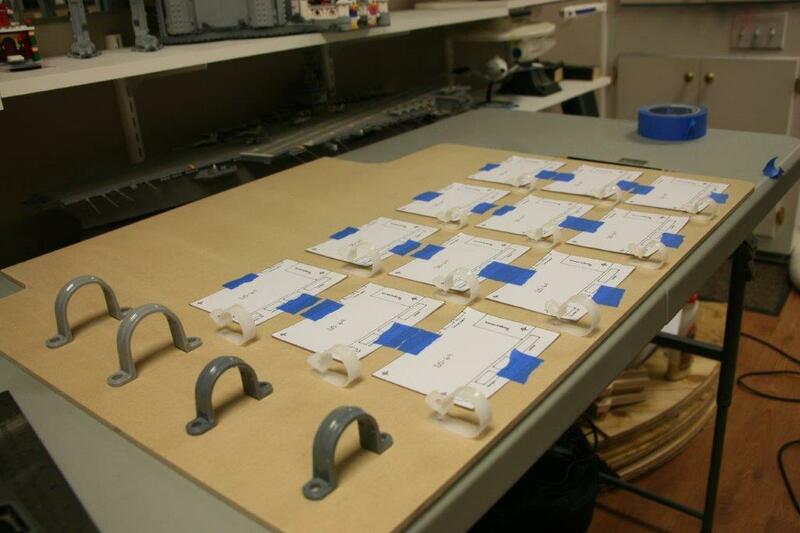 All mounting holes for the decoders and wiring looms are drilled, with the decoders numbered for switches controlled. I then mounted the DS 64s and the wire looms and they were ready to slide into place. 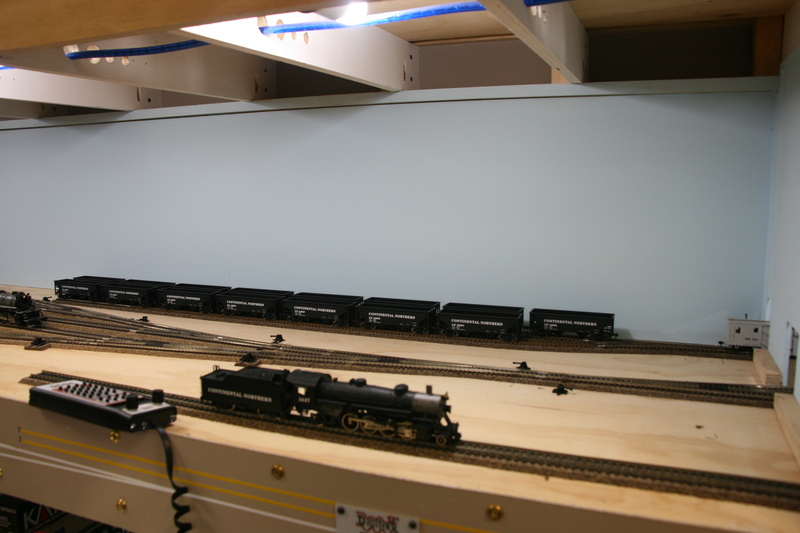 First set of DS 64’s mounted on panel and ready for the layout. Once in place it was a matter of pulling the wires and then the long process of hooking them up. 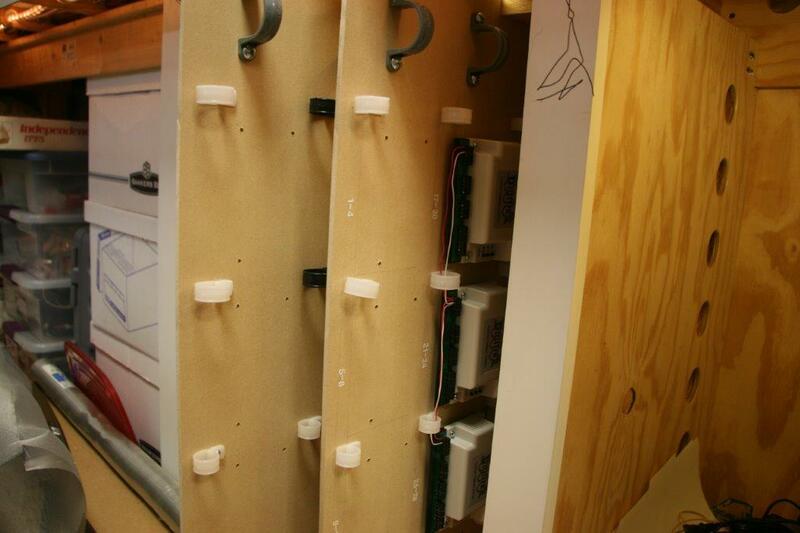 DS 64’s mounted and panels slid into place. The DS 64’s mounted with the wires pulled and ready to be hooked up. First set of DS 64’s in and wired, ready to be powered up and programmed. With that done it was it was time to start programming the decoders. I had watched the video from Digitrax several times. Though it looked straight forward, I figured that meant that it wasn’t. Turns out it actually is as simple as Digitrax says it is. With the switch motors wired and programmed I went around to make sure they all worked properly. A couple of them were working opposite of what they were supposed to be doing. It was a simple matter of reversing the wires to set that straight. Now, you would think that this was the end of this story. Turns out there is more.